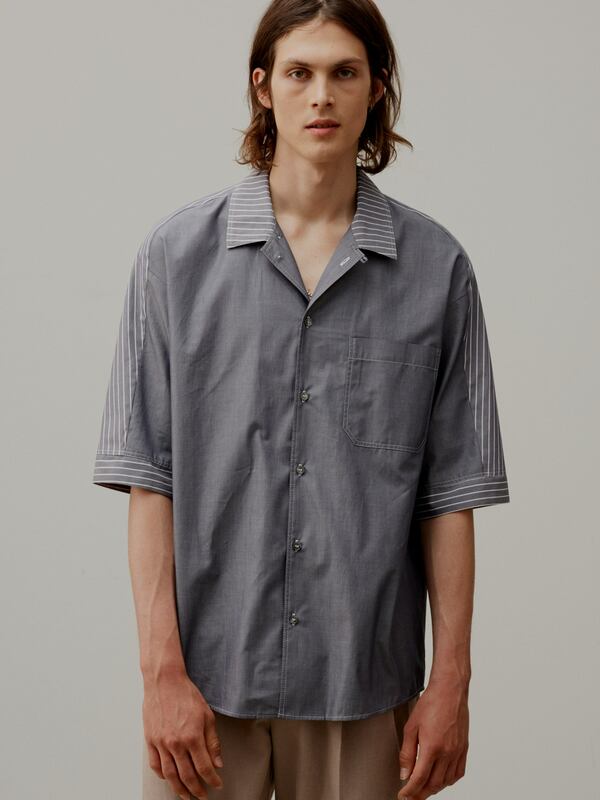 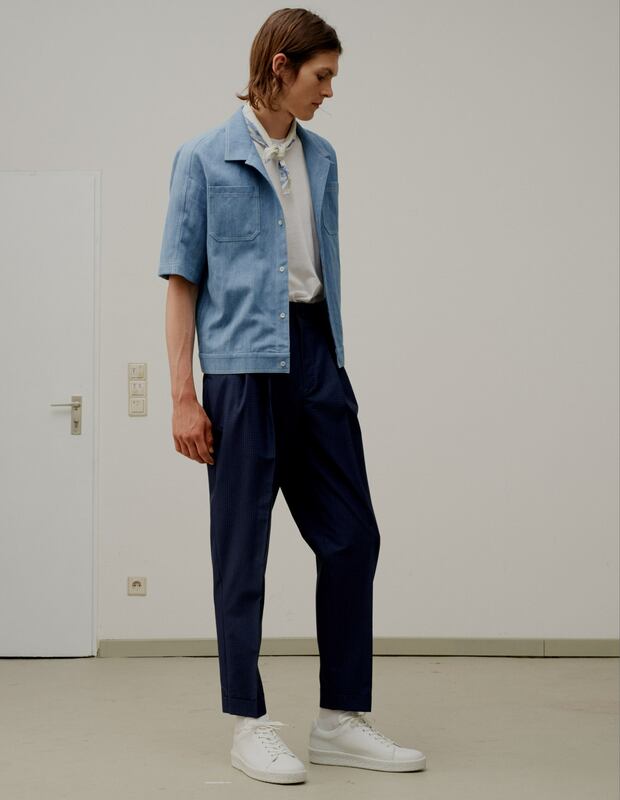 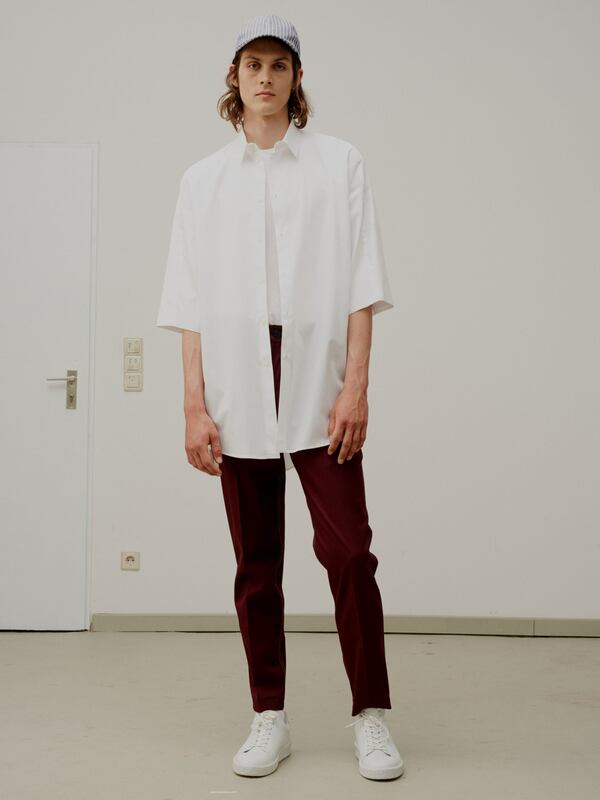 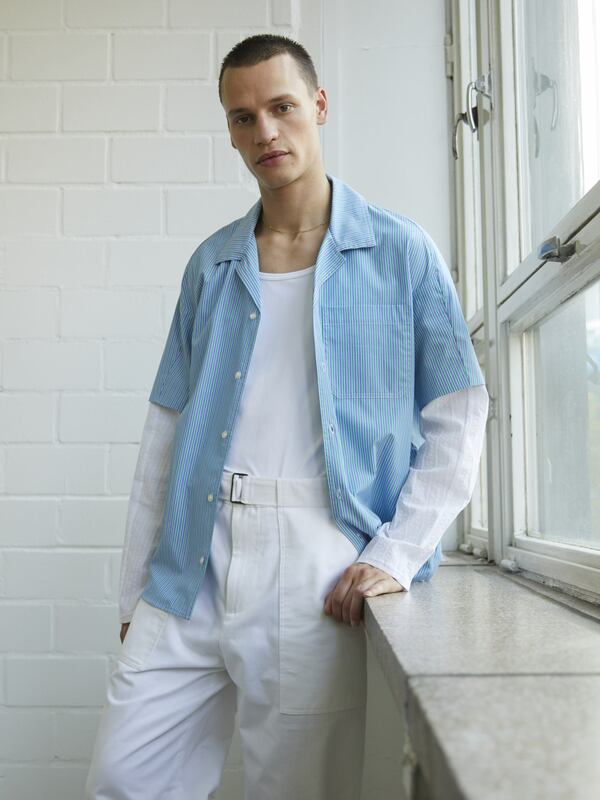 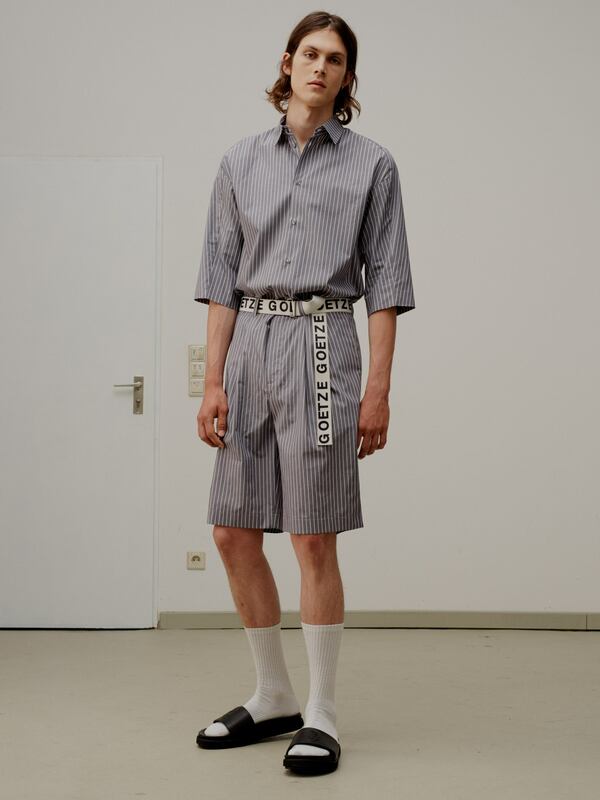 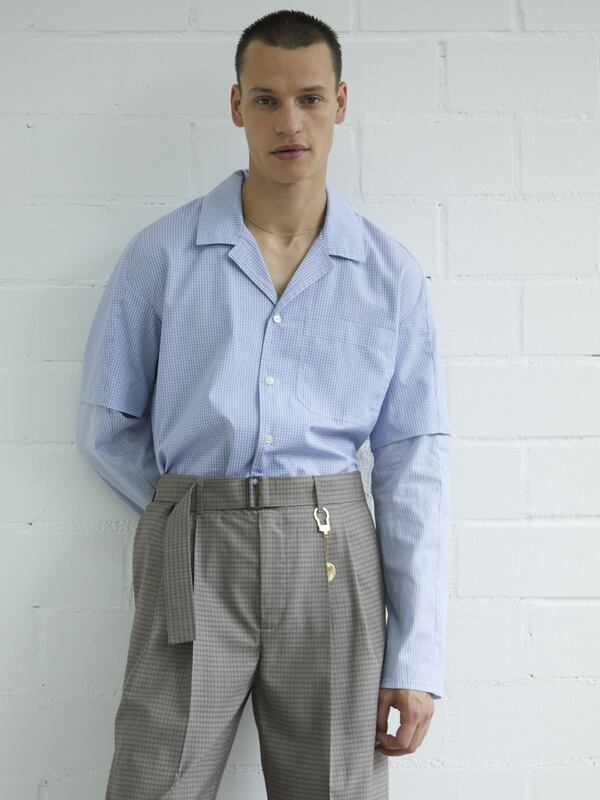 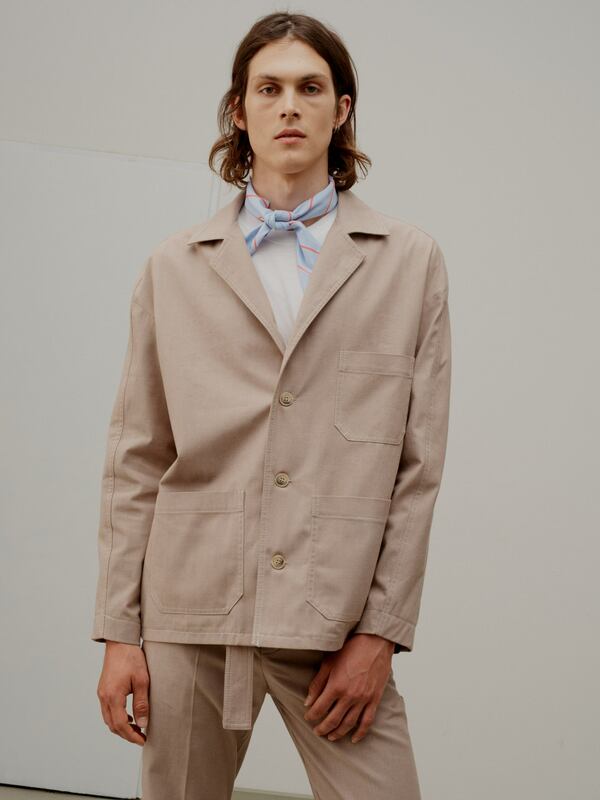 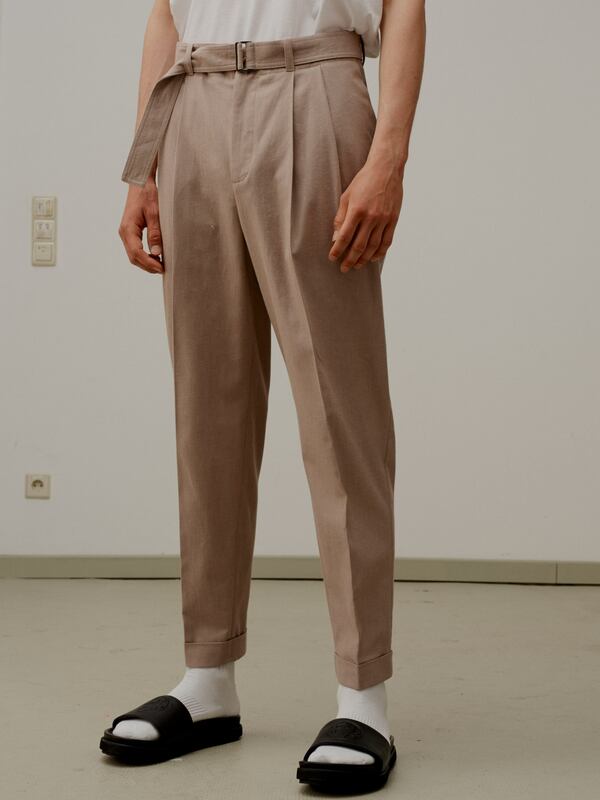 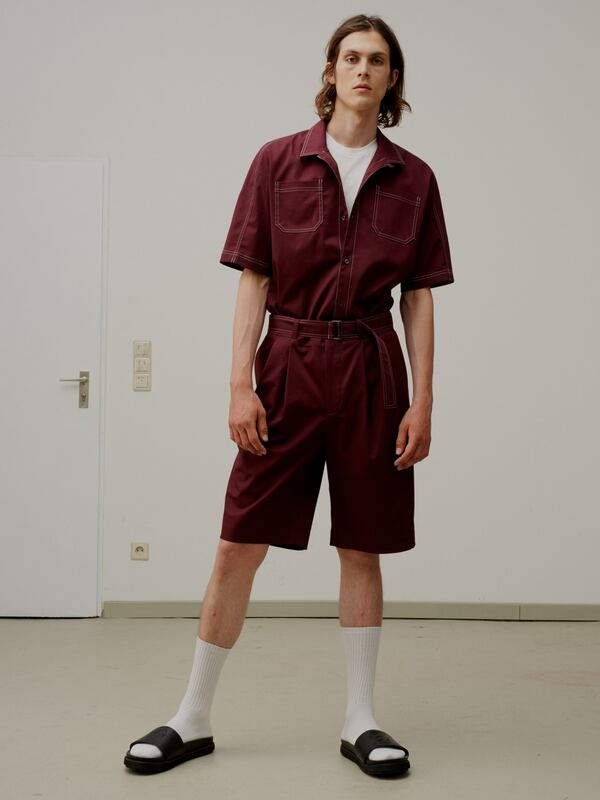 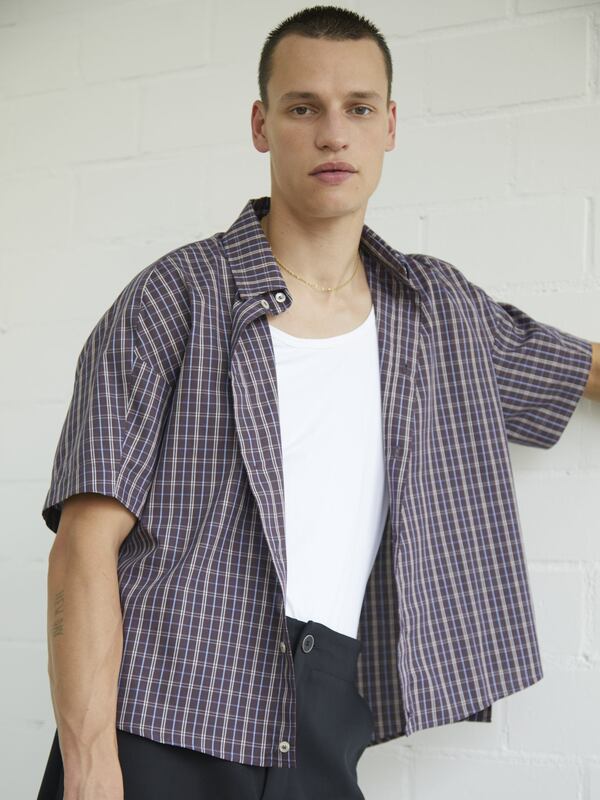 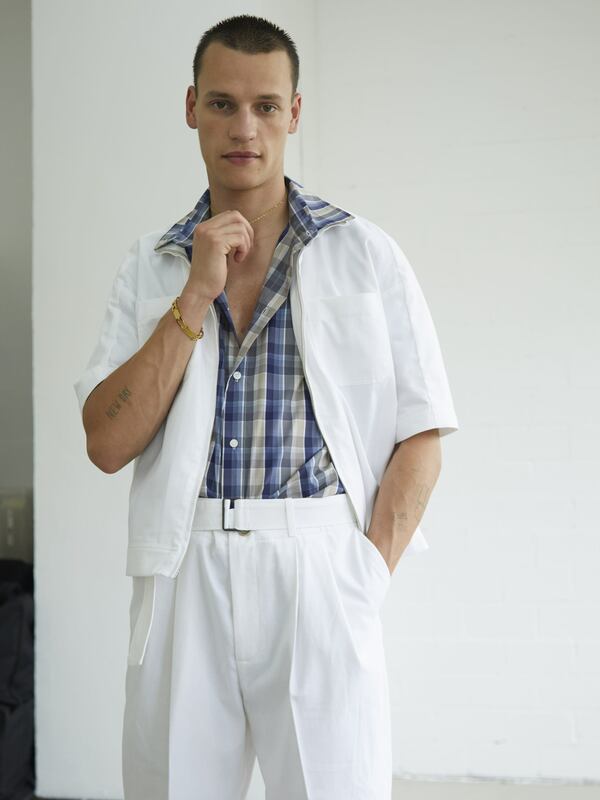 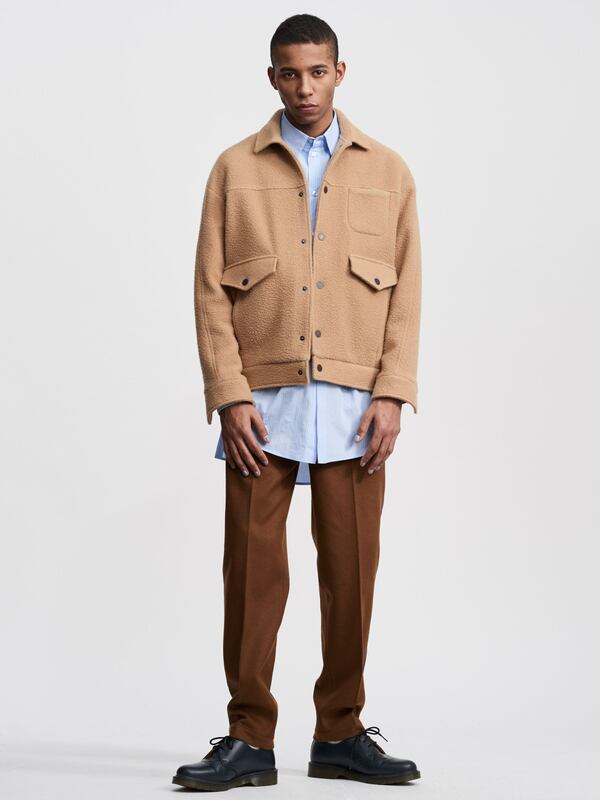 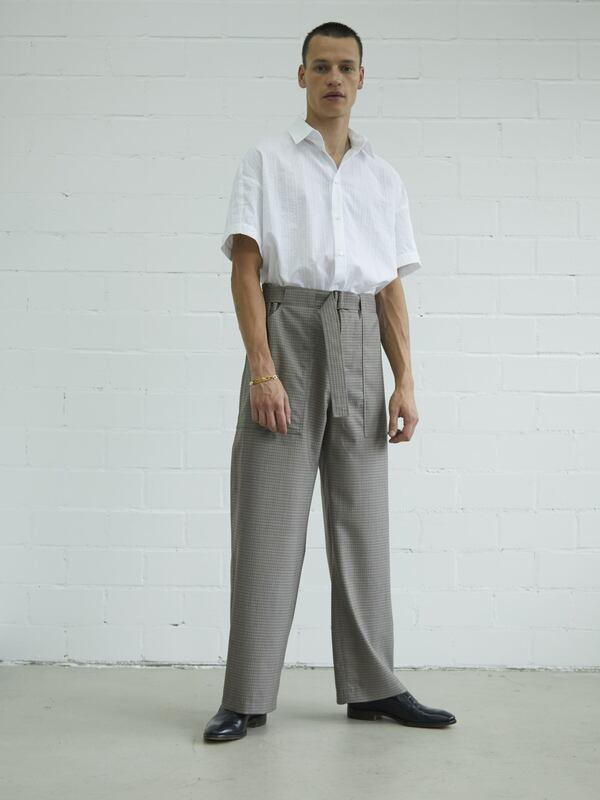 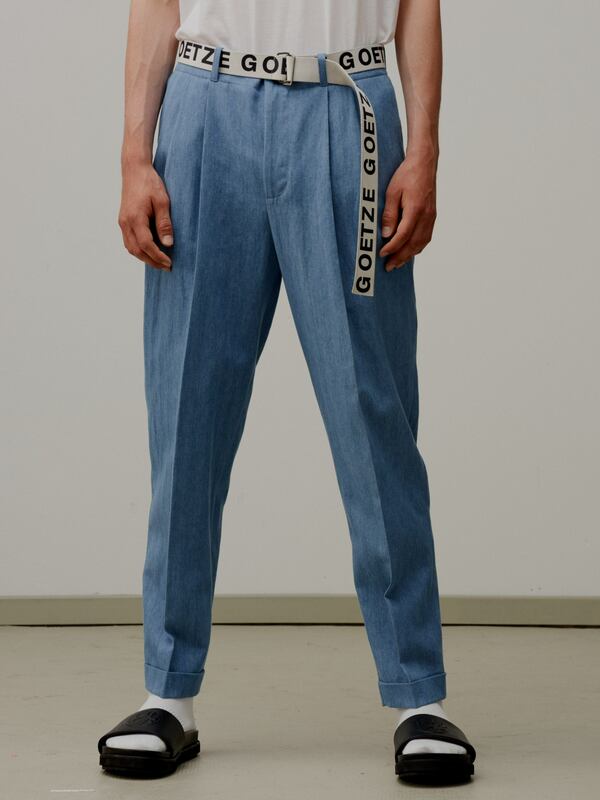 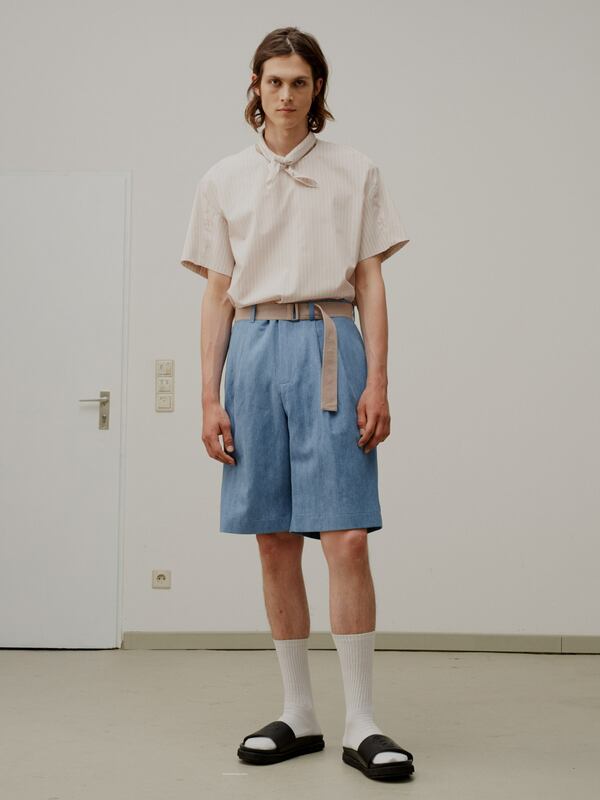 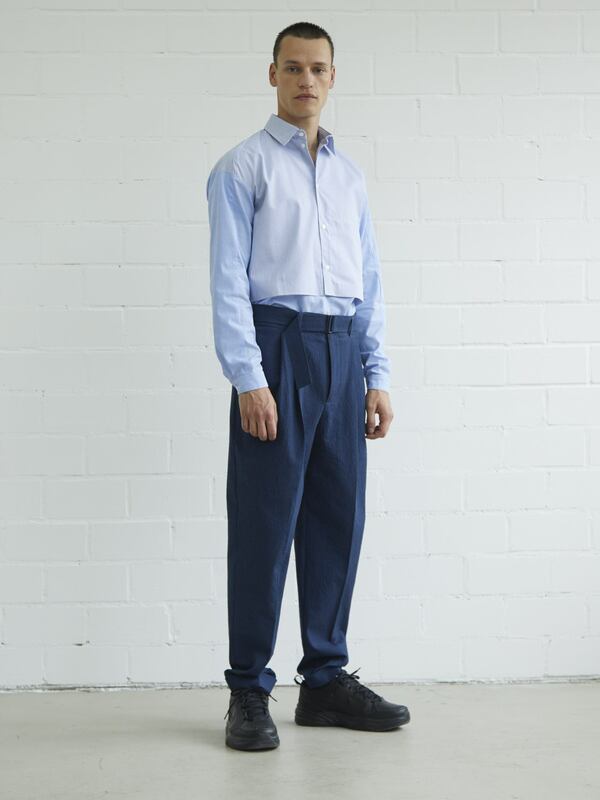 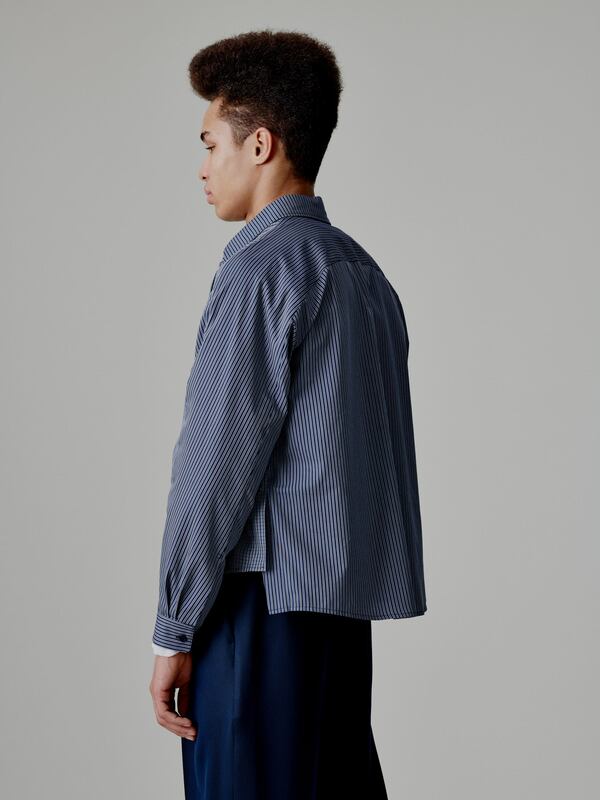 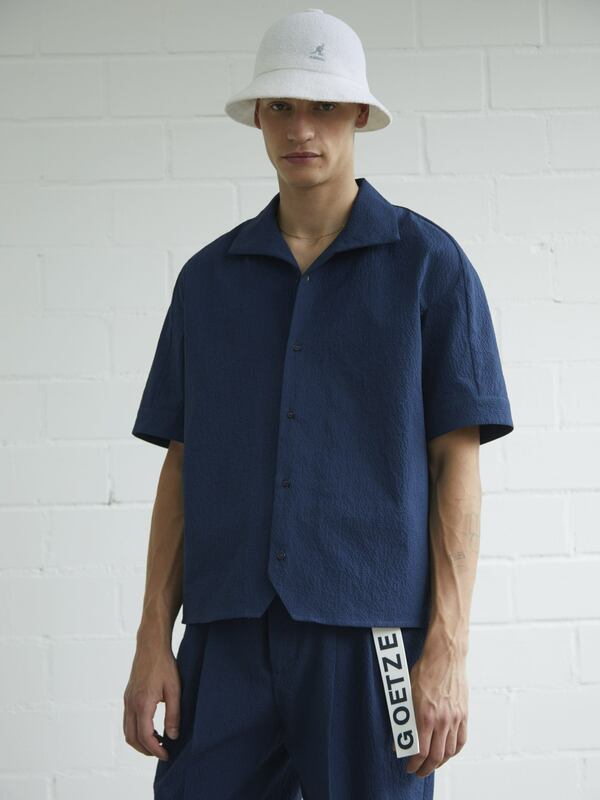 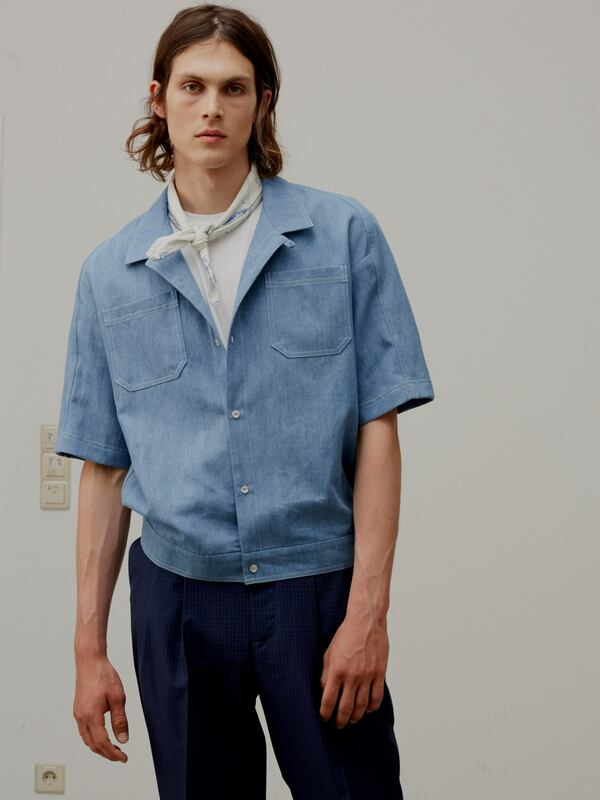 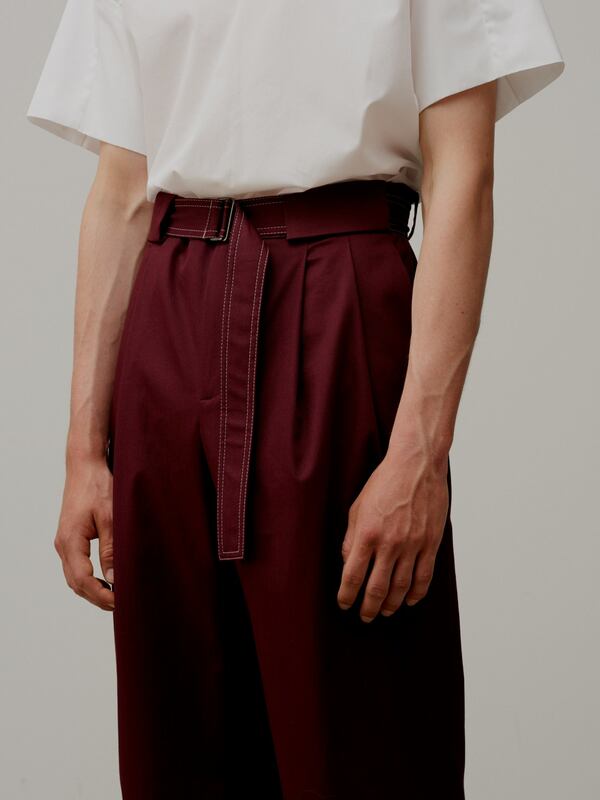 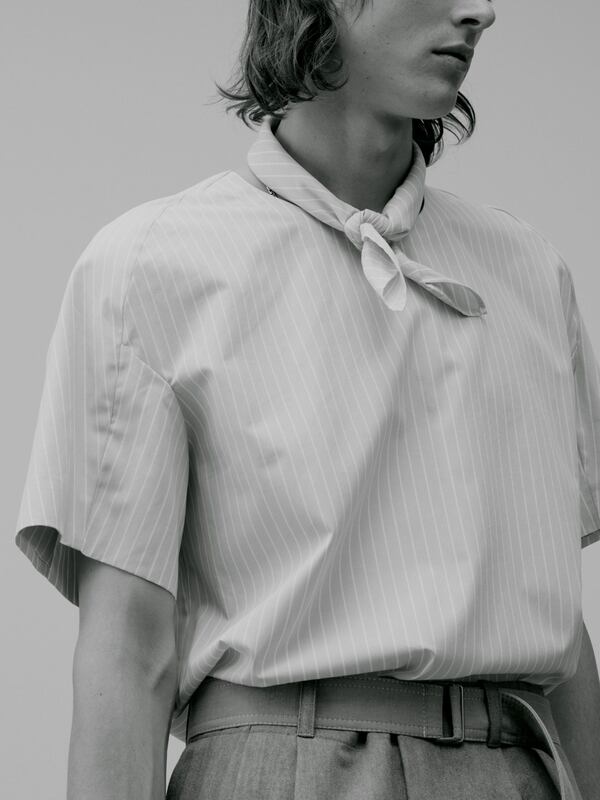 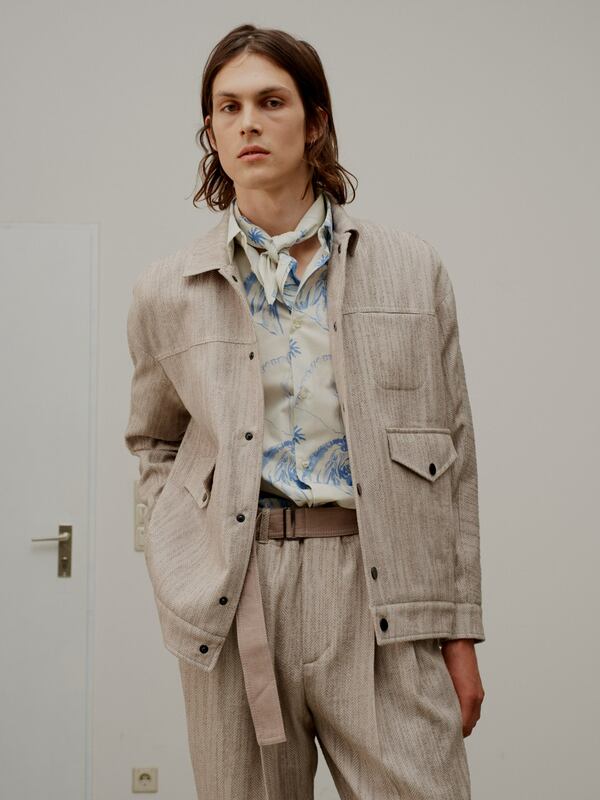 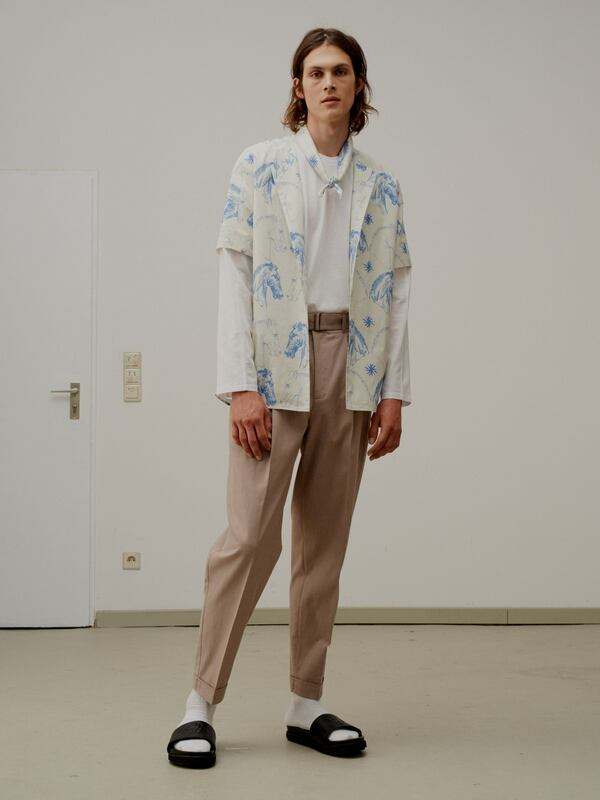 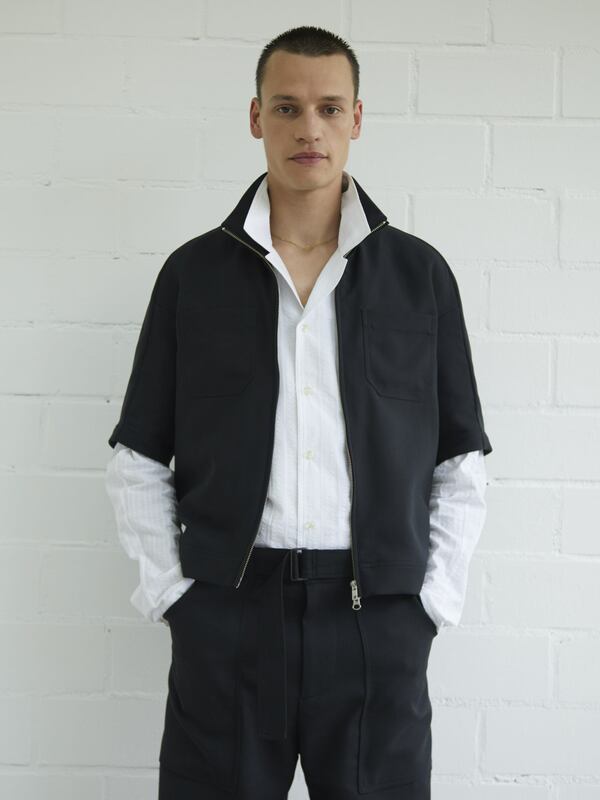 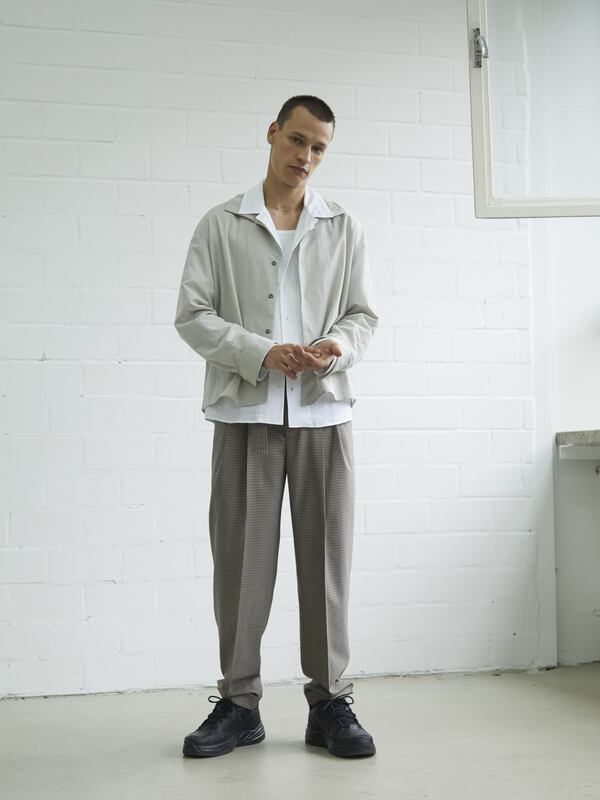 Somewhere in German suburban landscapes, where checked shirting is worn with cargo Bermuda pants the SS19 collection of GOETZE is located. 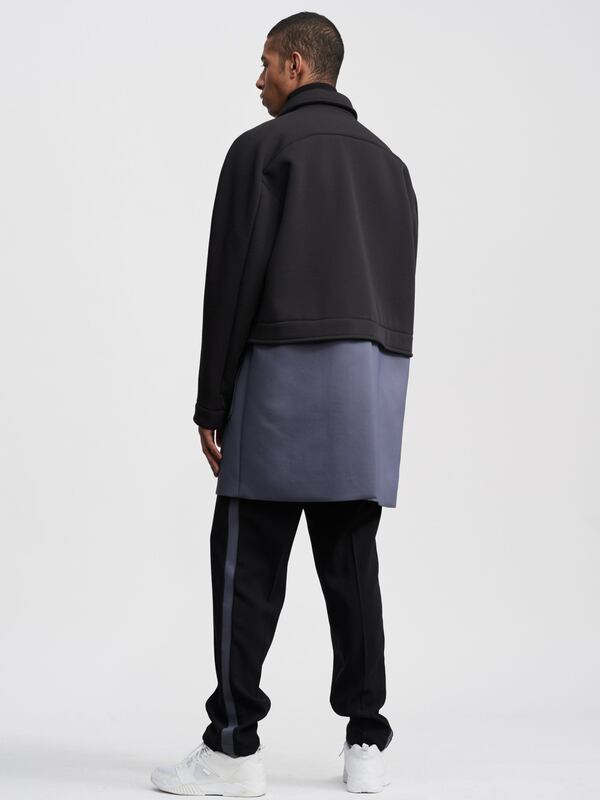 At times more drastic and sometimes more subtly these references are altered in proportion and merged with signature elements of the brand. 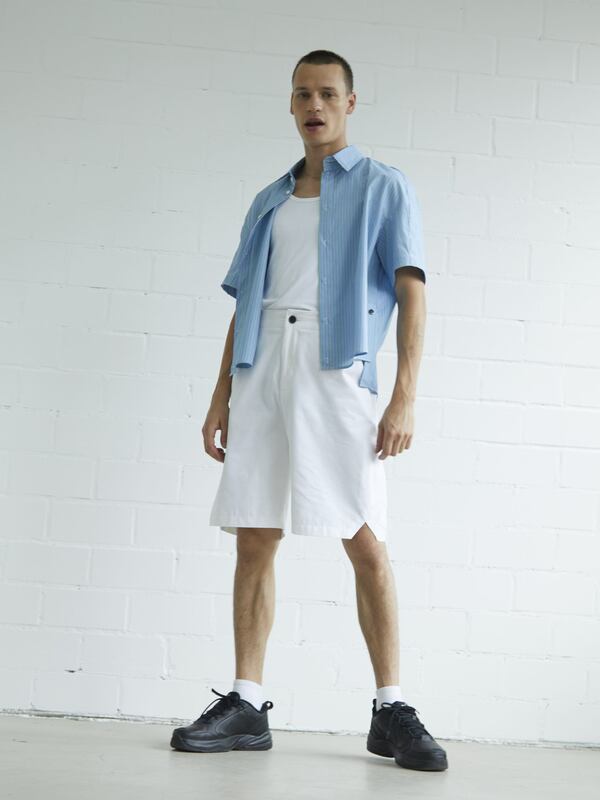 The colour range of white, light blue, khaki, and eggplant also draws inspiration from this suburban atmosphere. 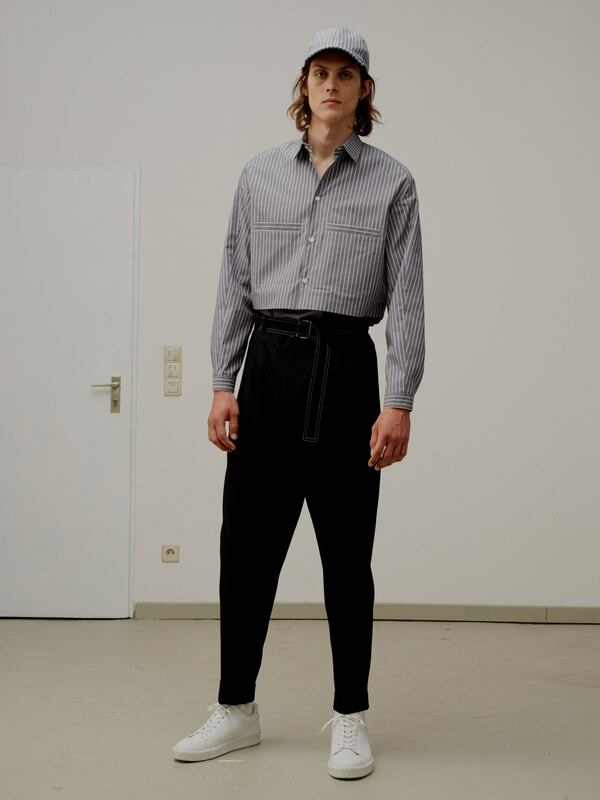 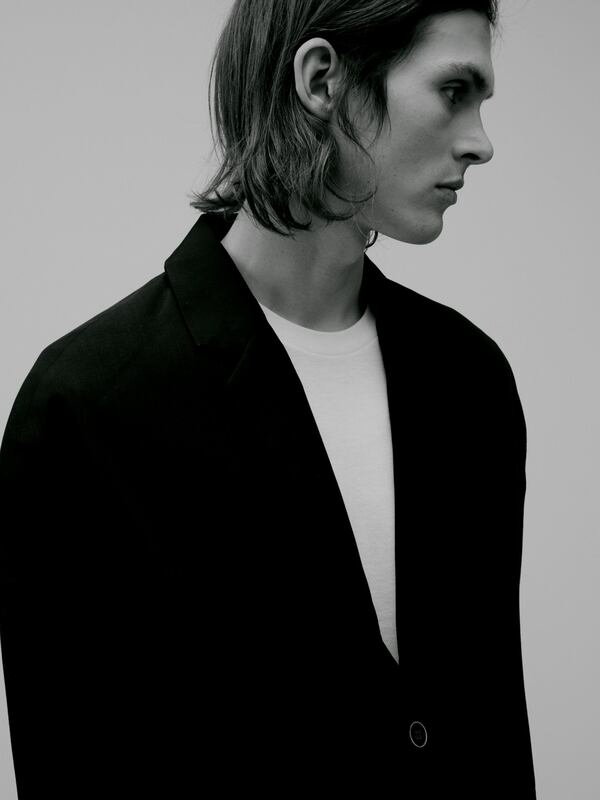 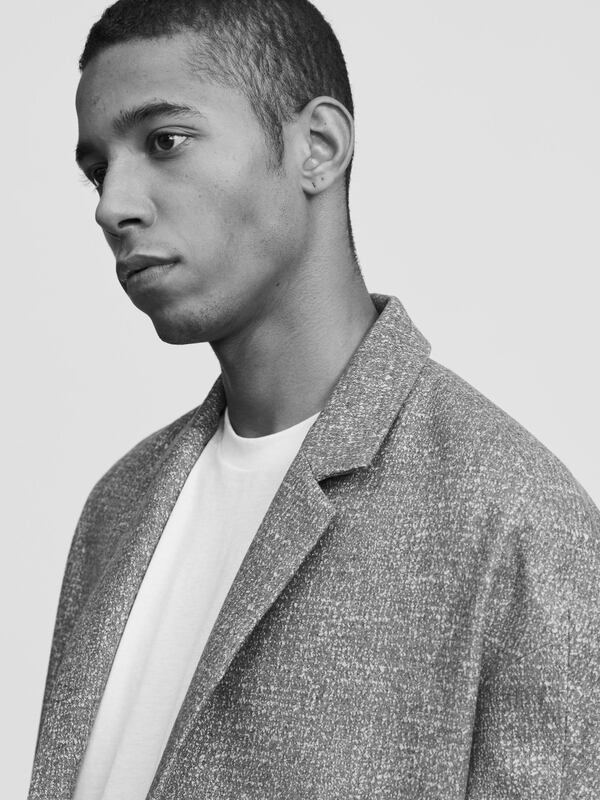 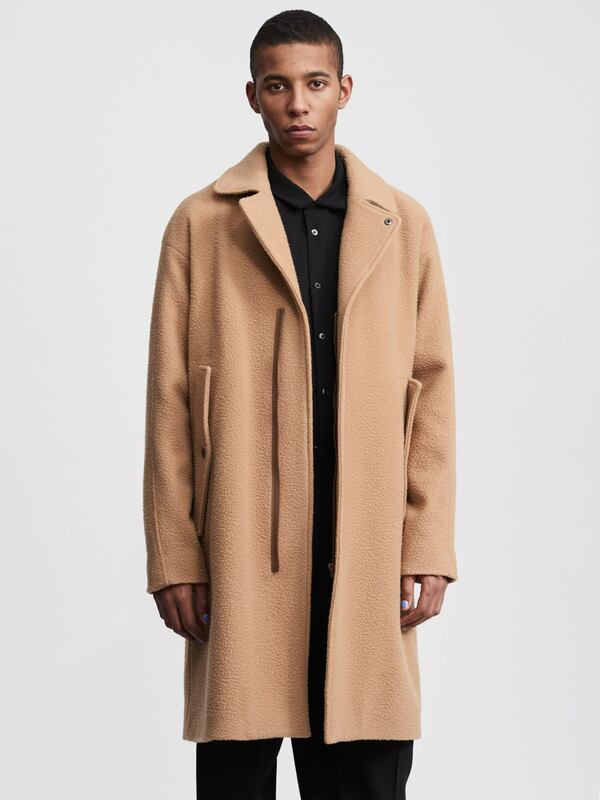 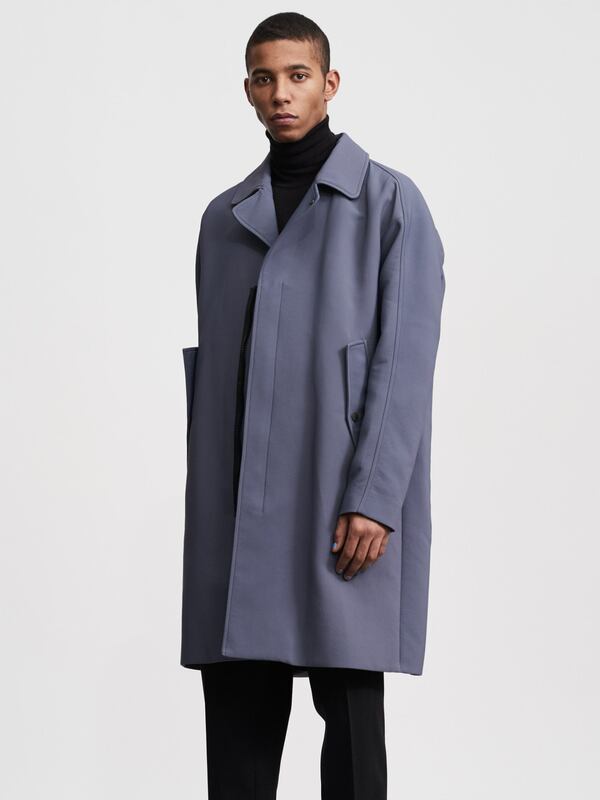 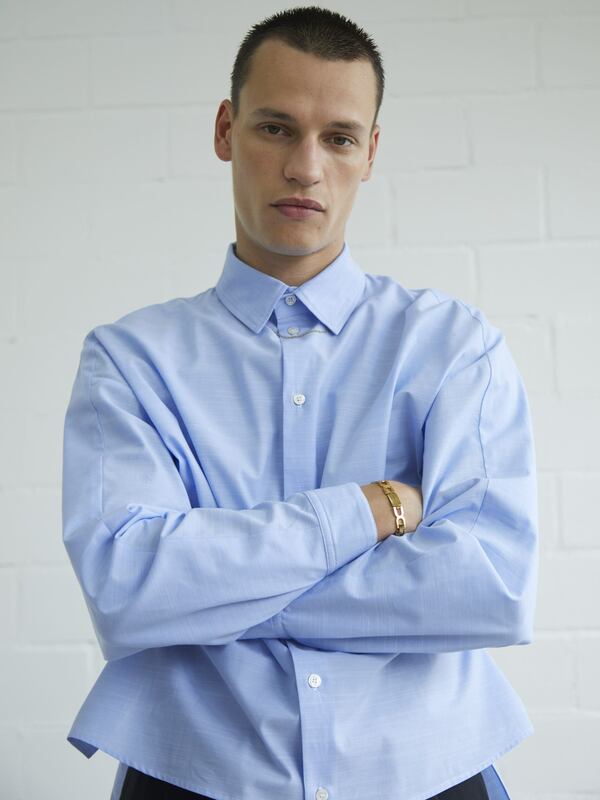 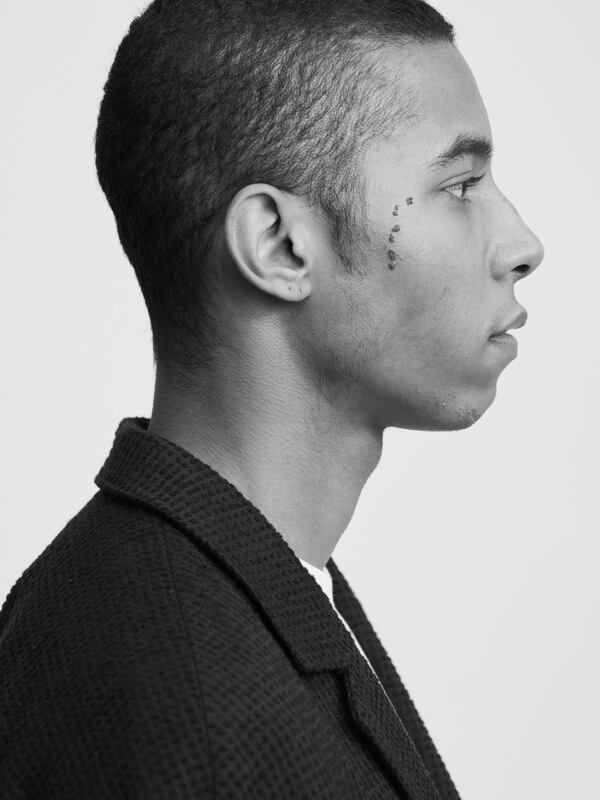 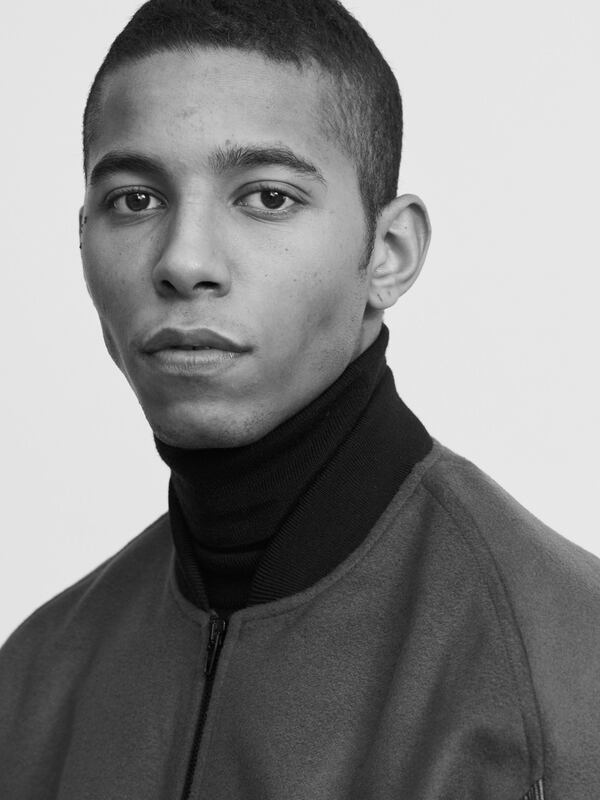 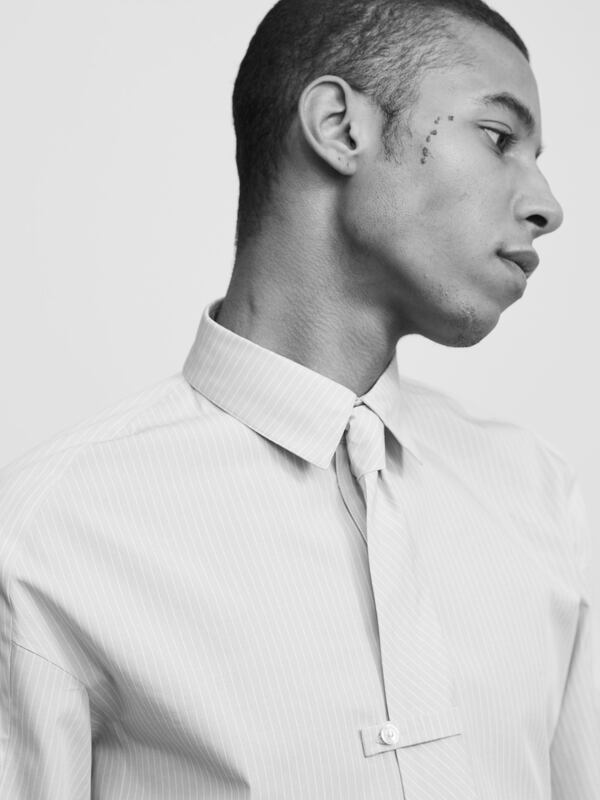 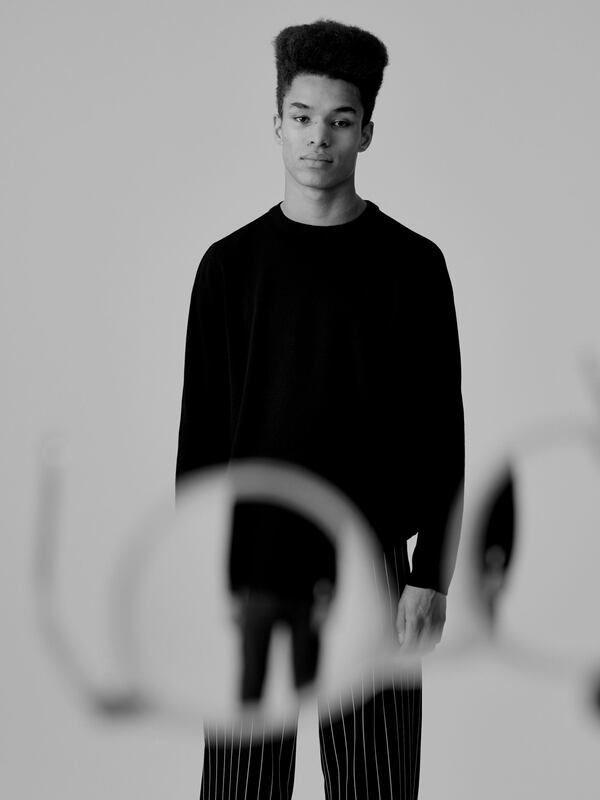 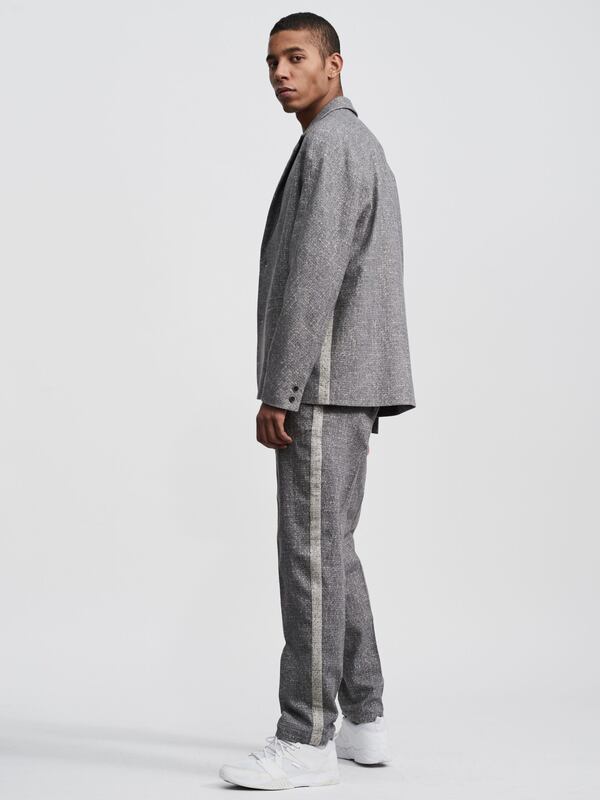 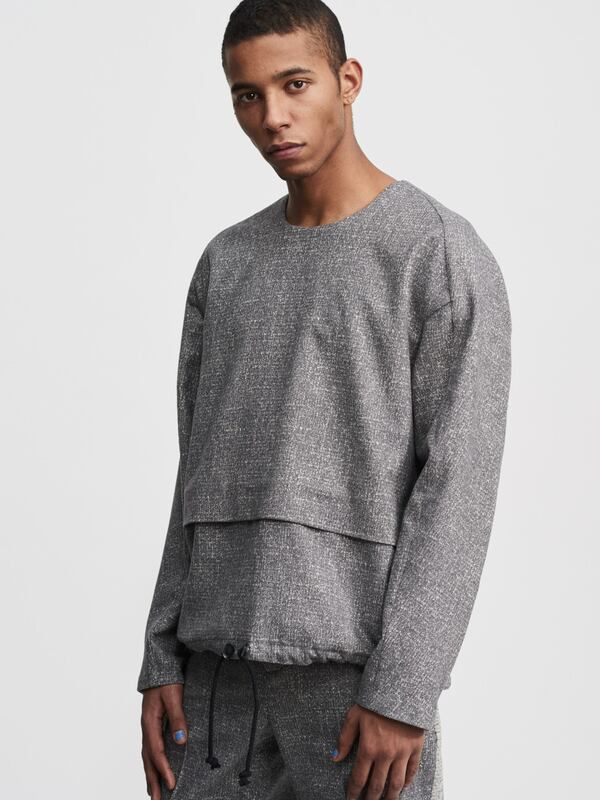 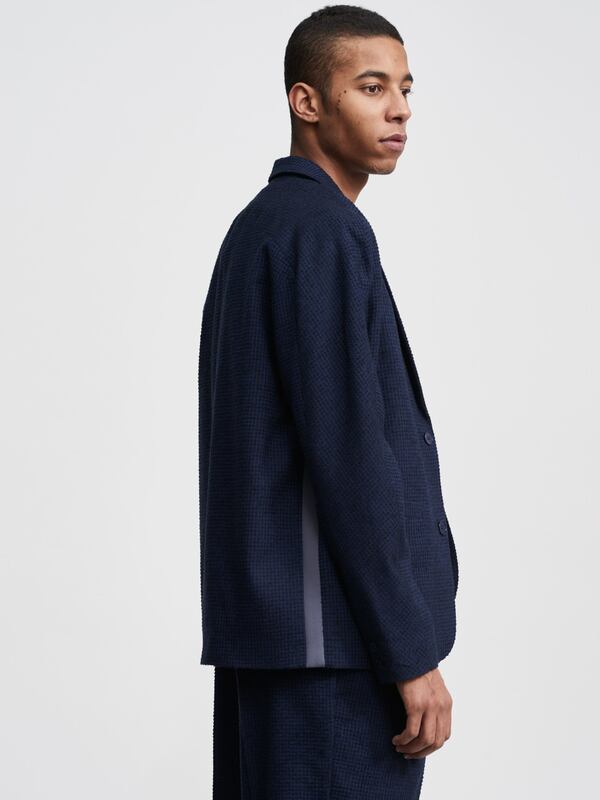 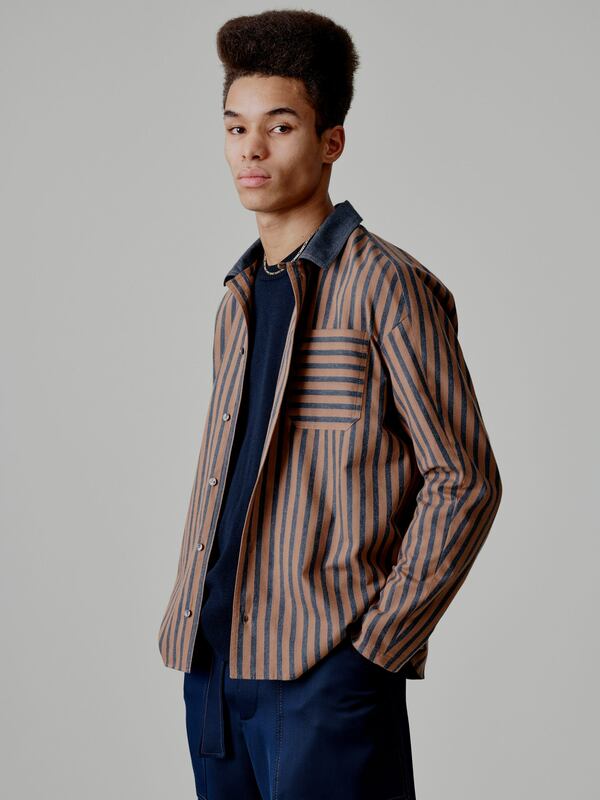 GOETZE re-appropriates this aesthetic and introduces a fresh take on best sellers in commercial menswear. 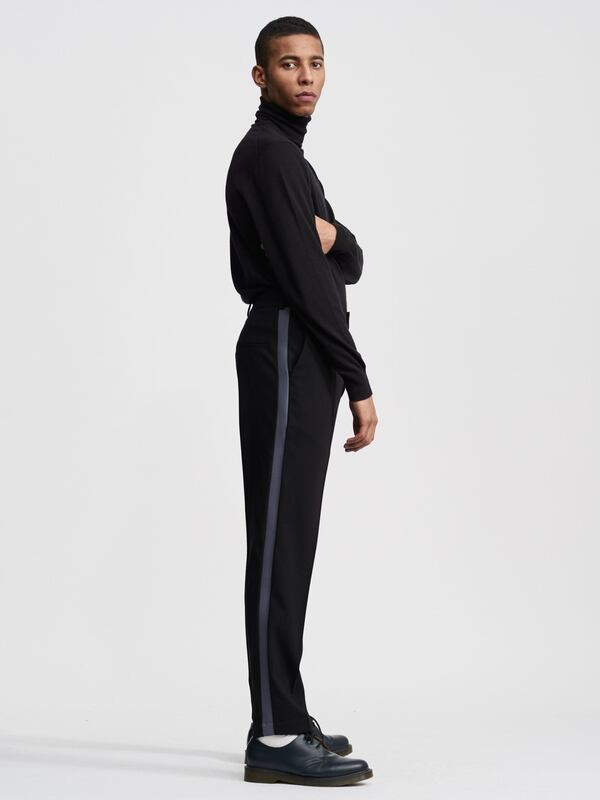 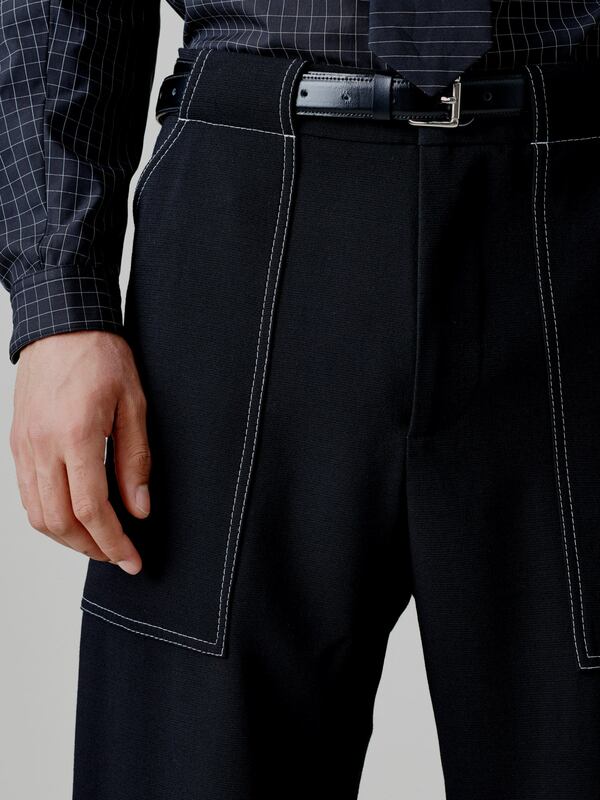 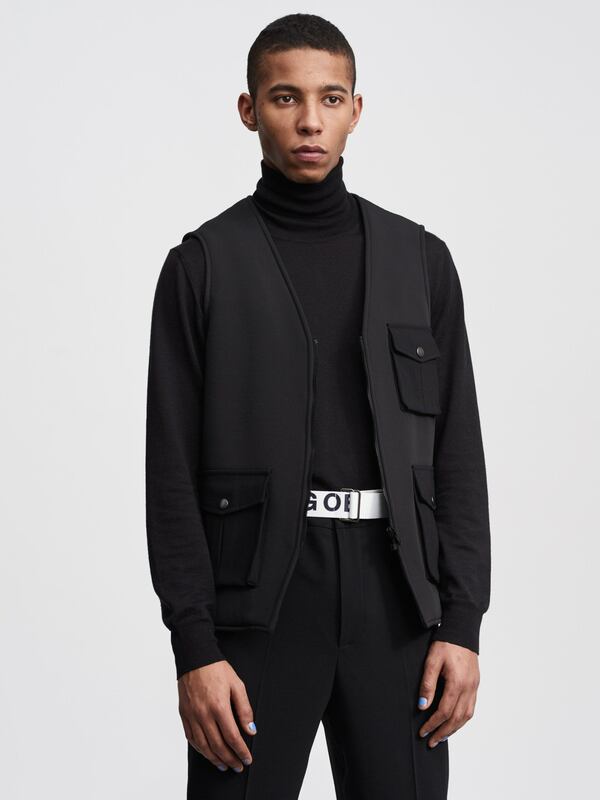 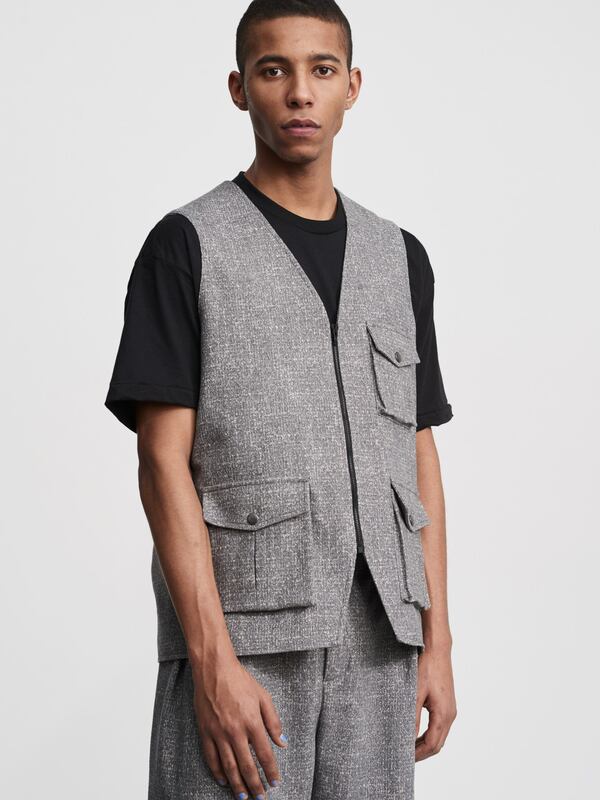 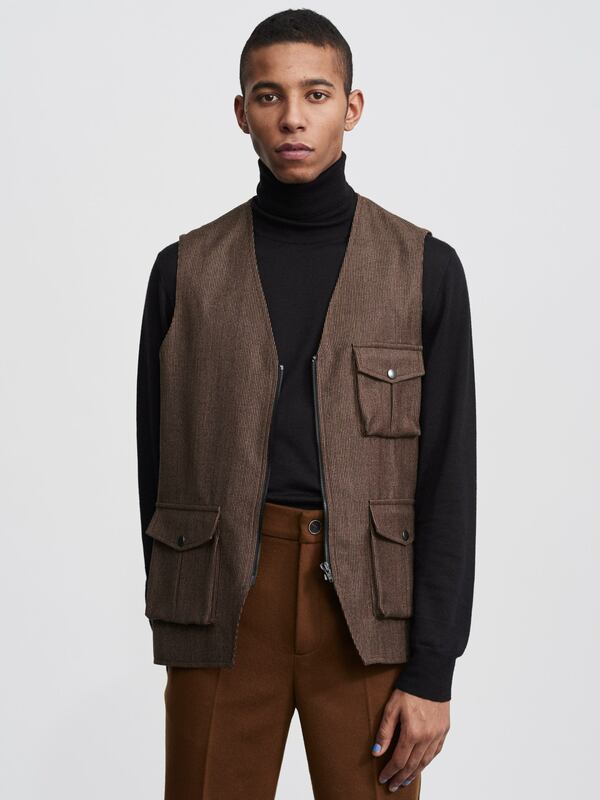 Pockets of cargo pants are inserted in high-waist trousers executed in classic checked wool and thereby make an element of classic work wear seem elegant. 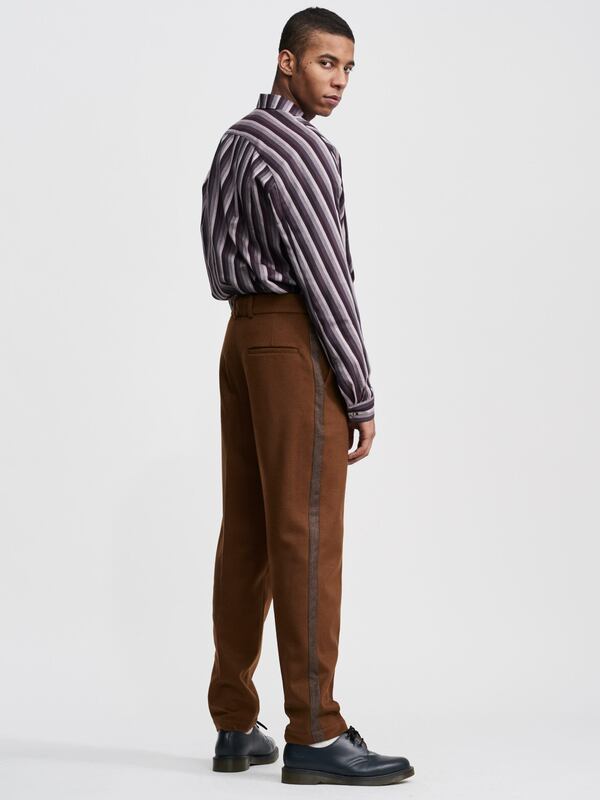 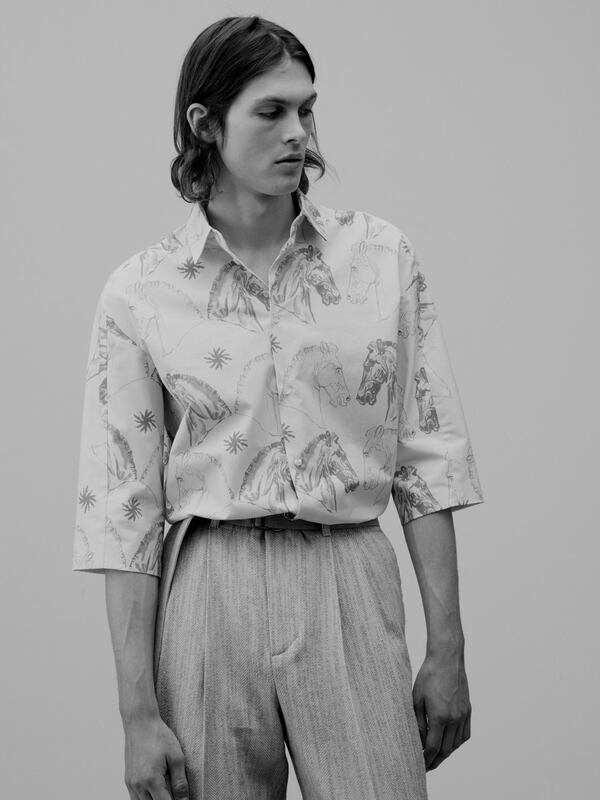 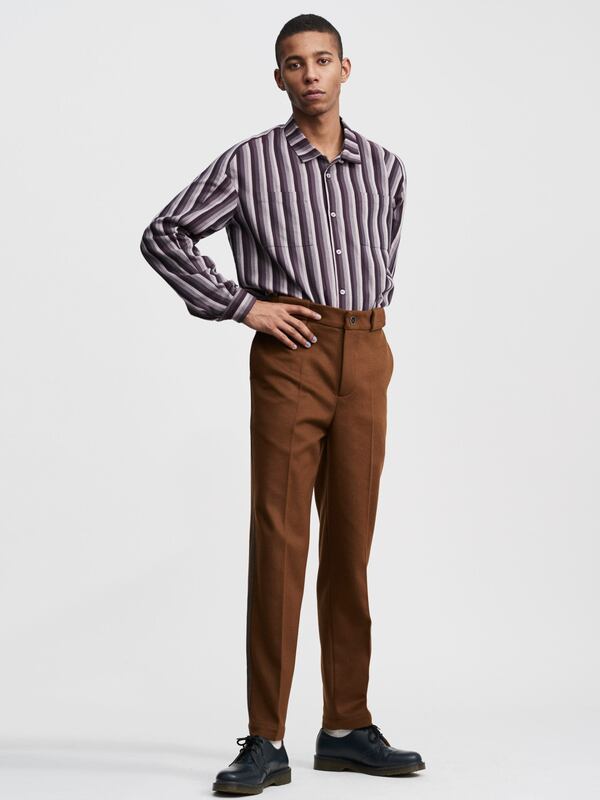 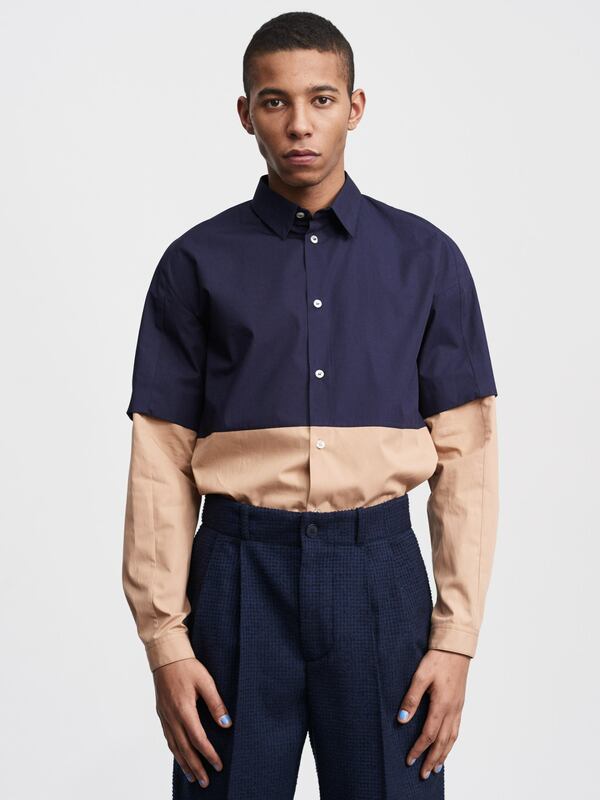 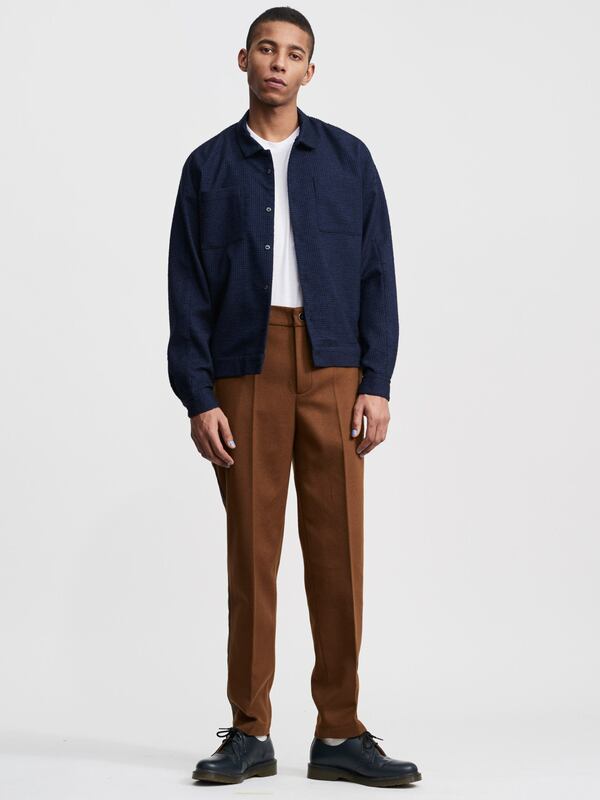 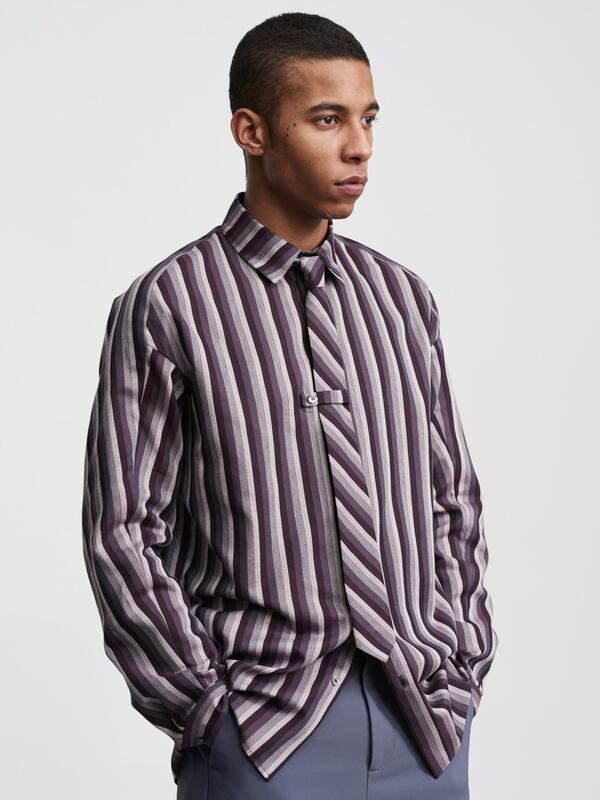 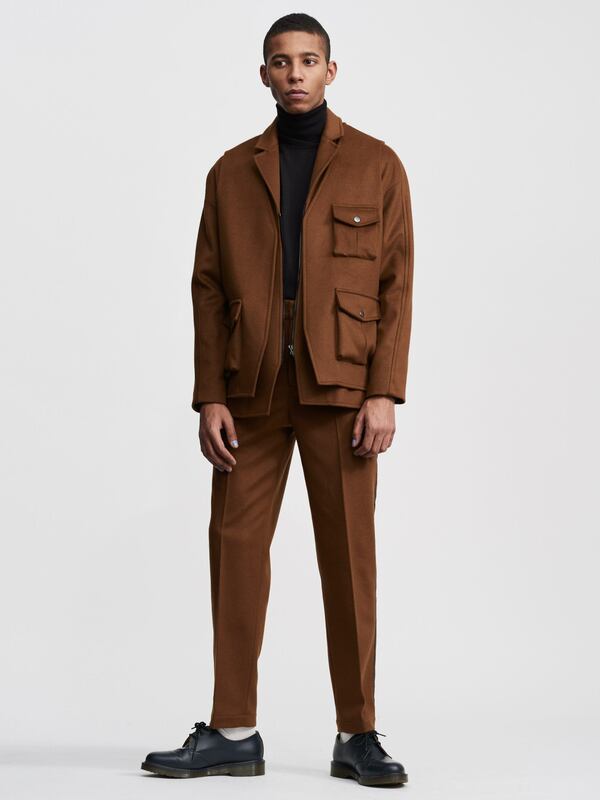 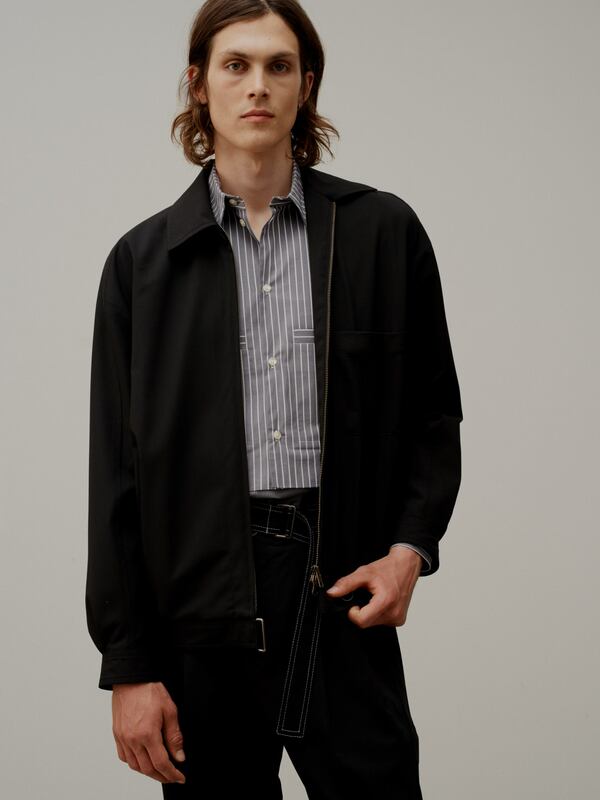 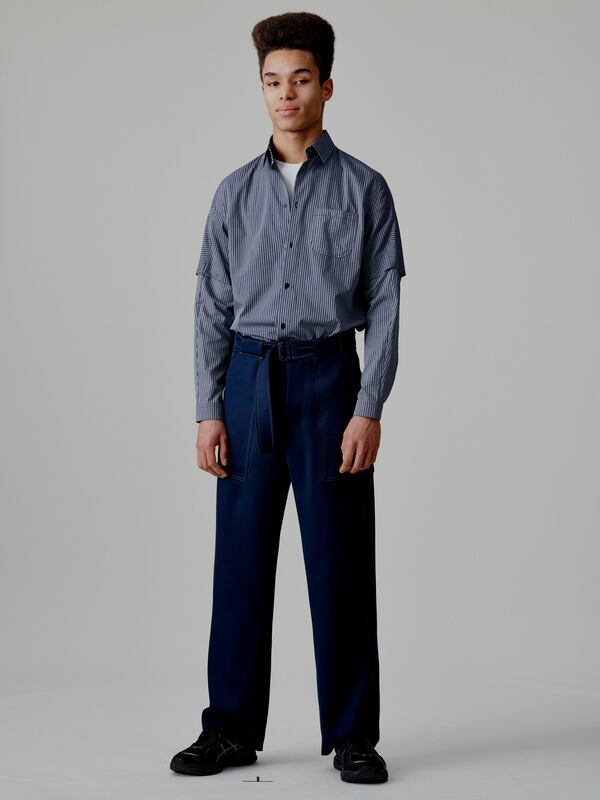 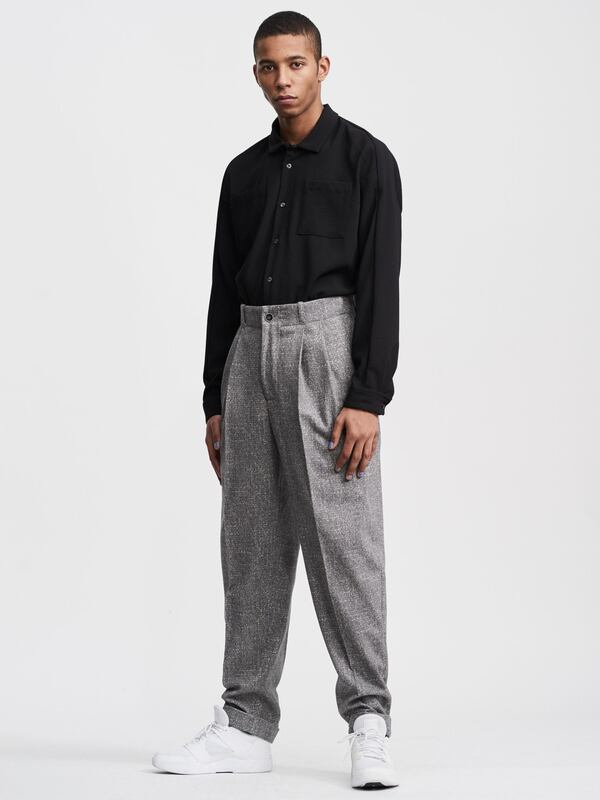 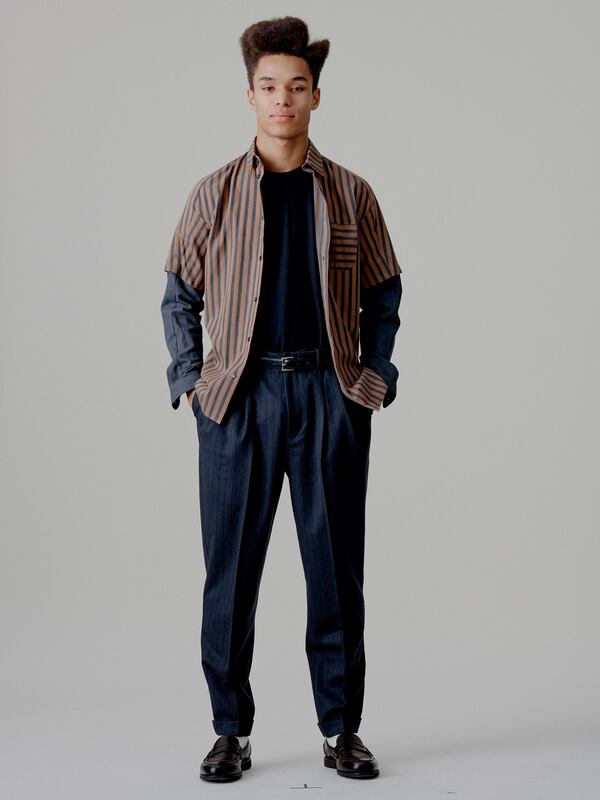 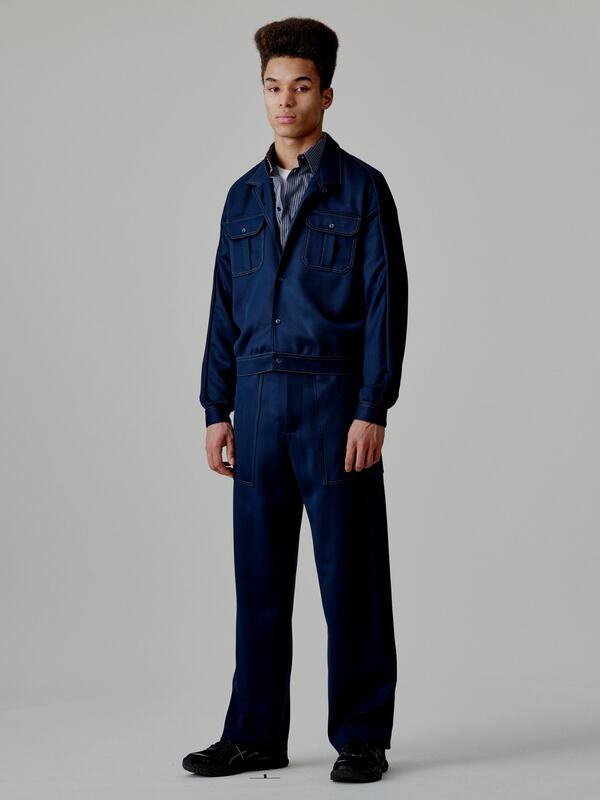 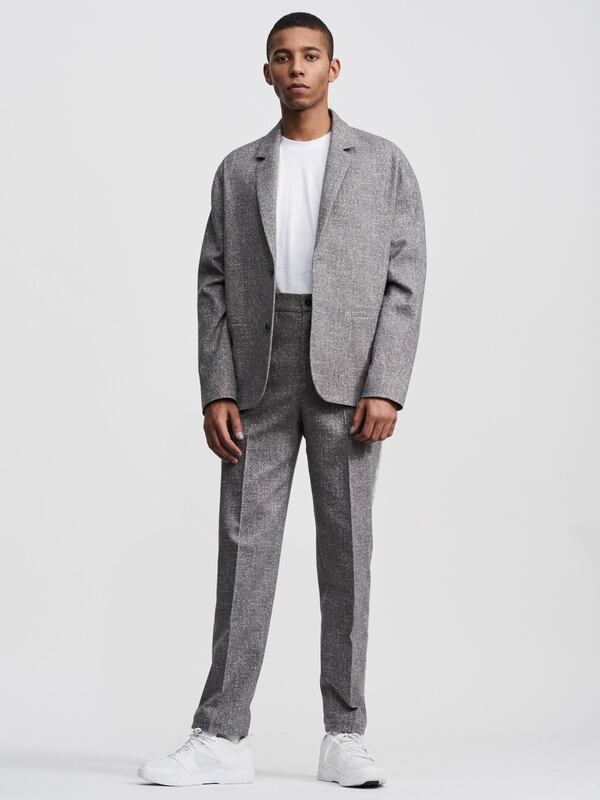 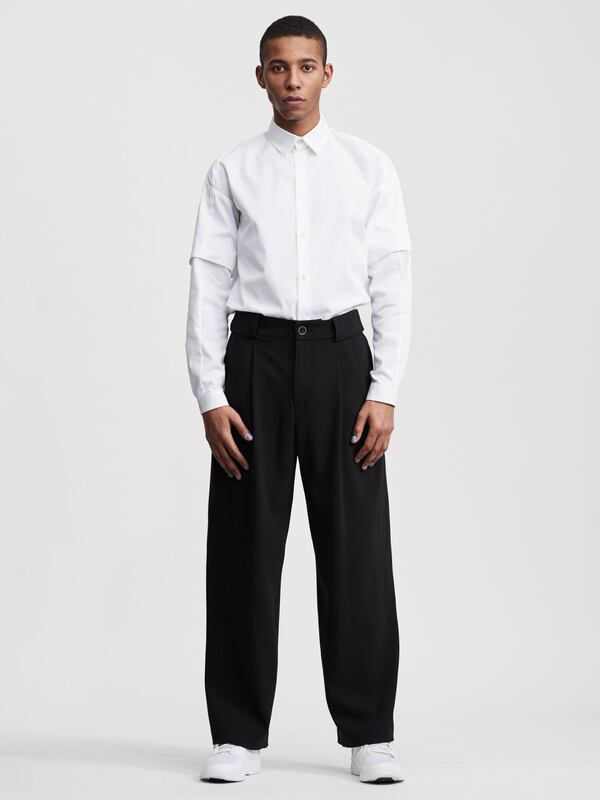 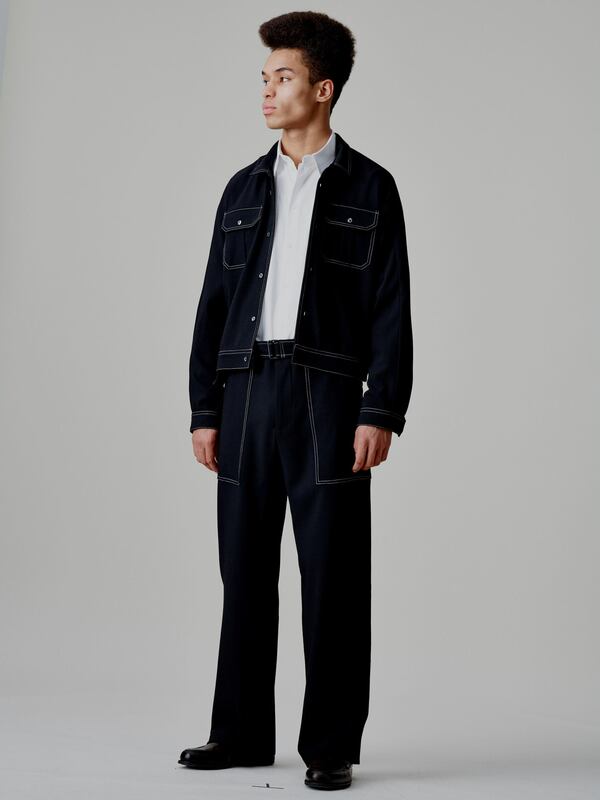 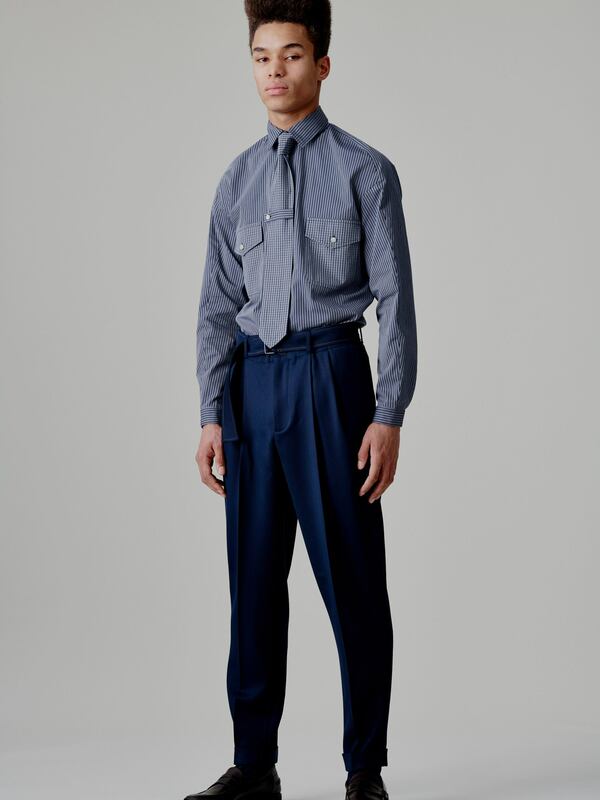 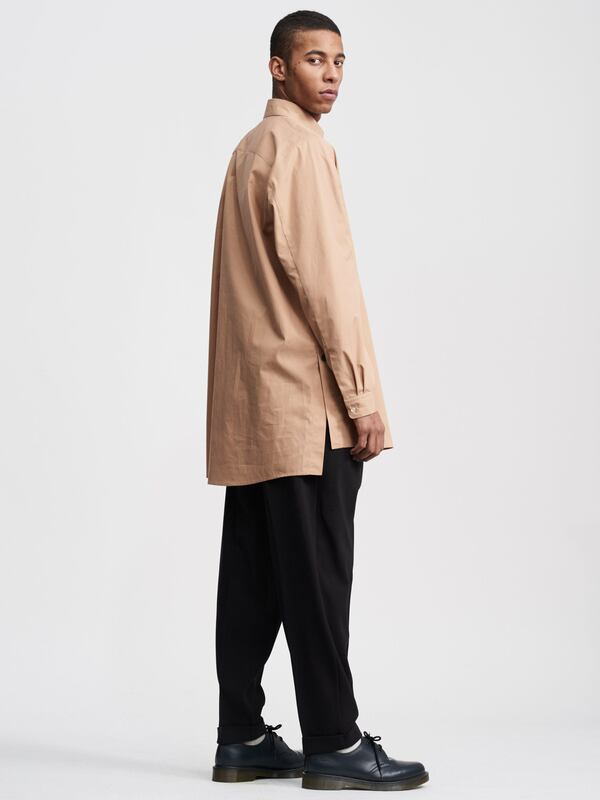 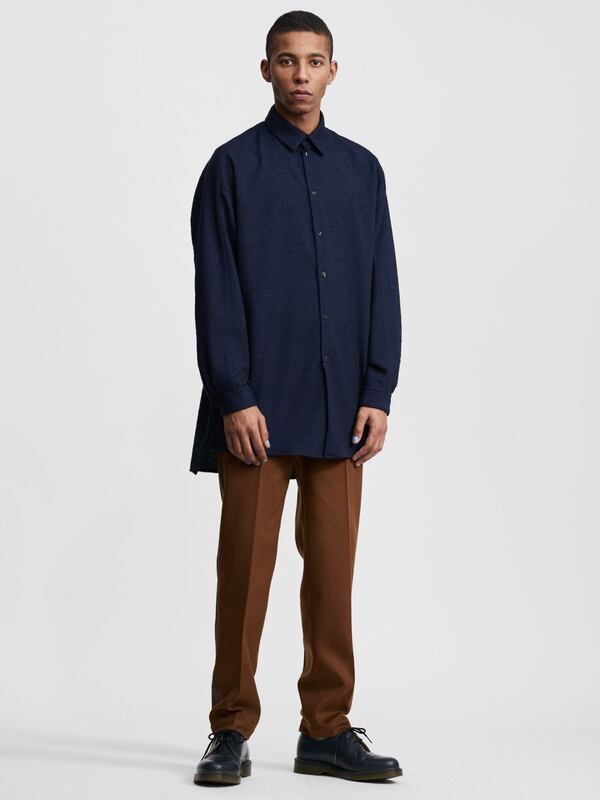 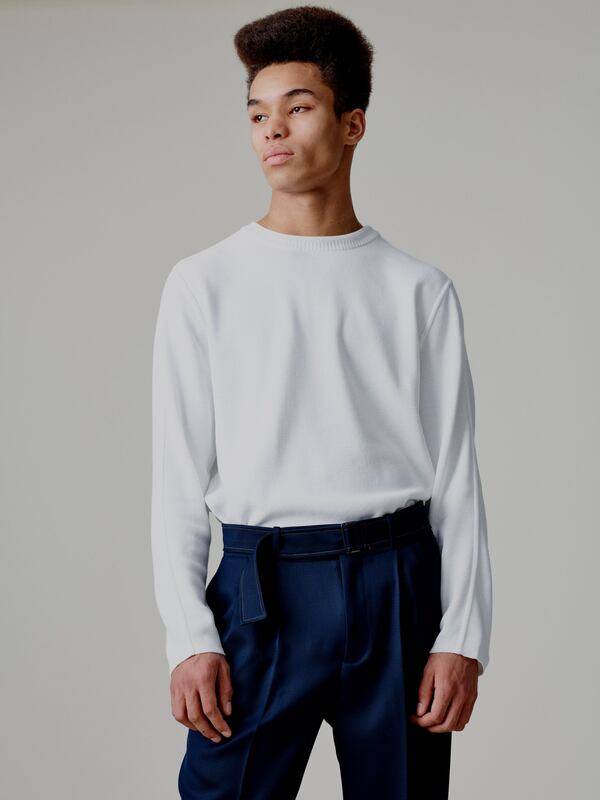 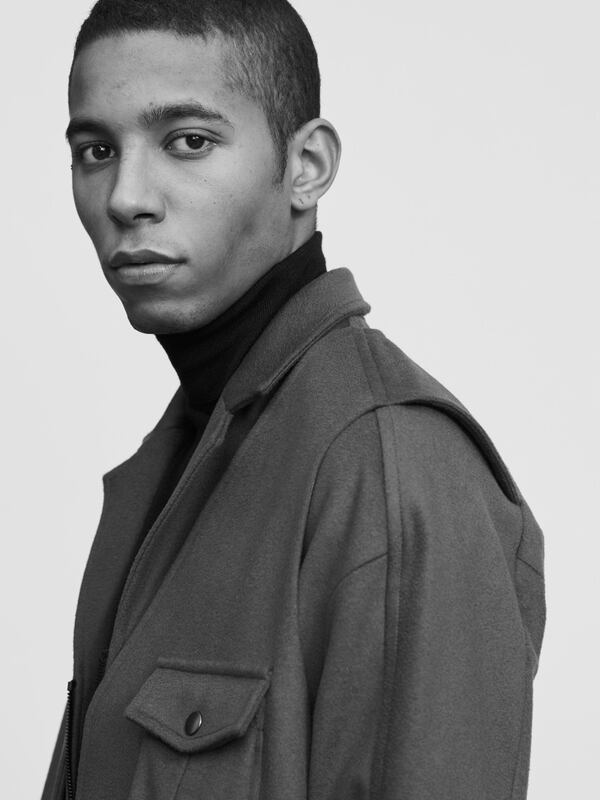 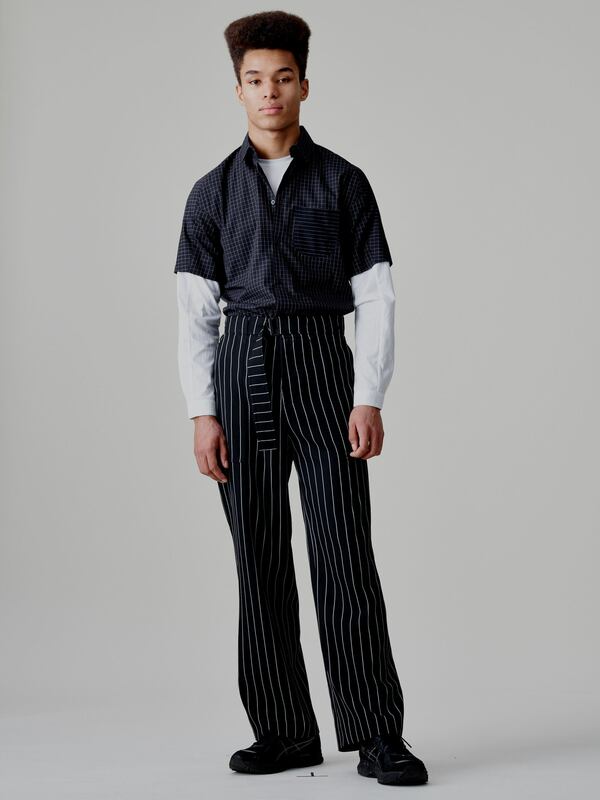 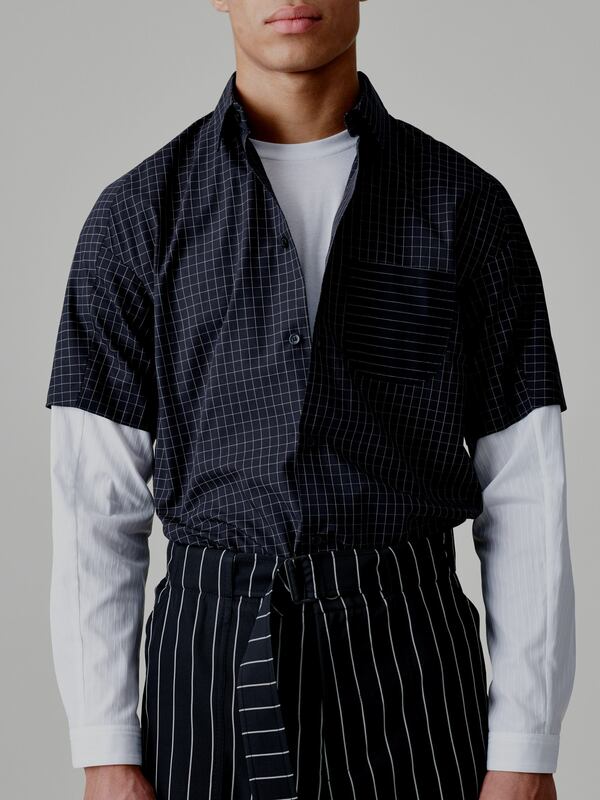 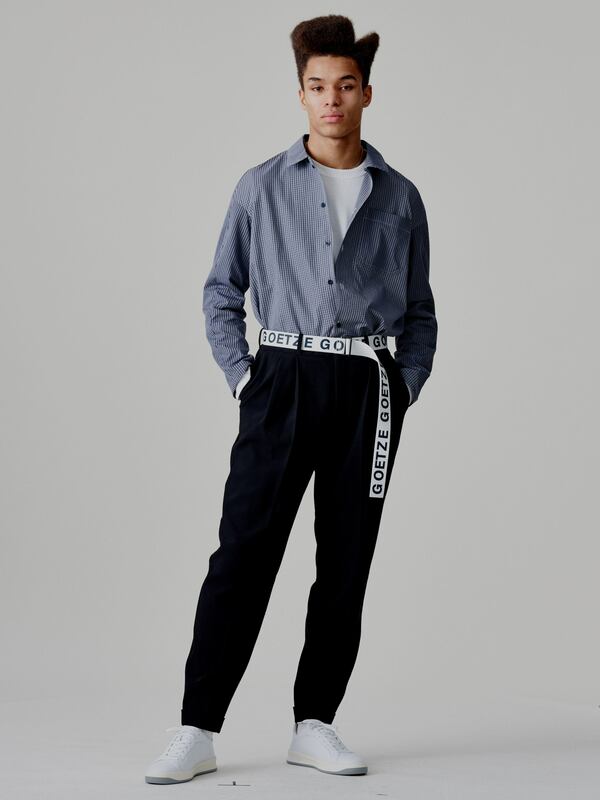 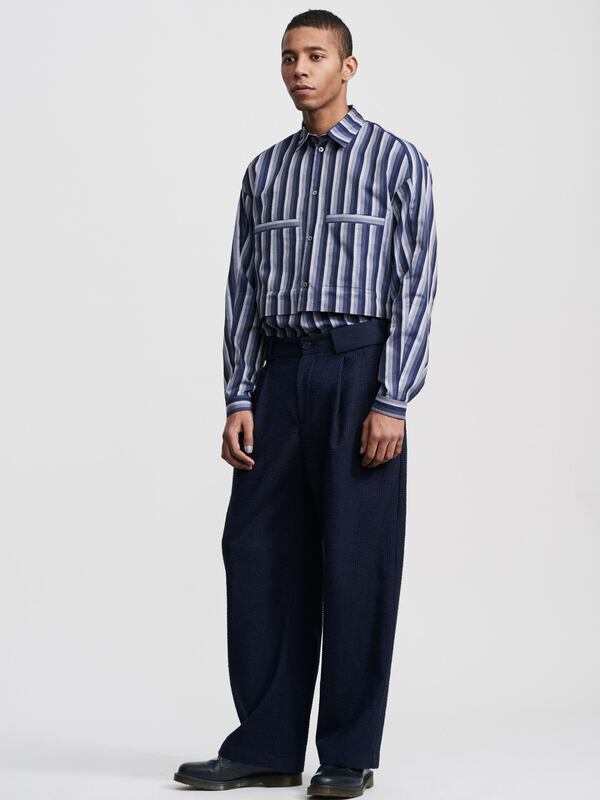 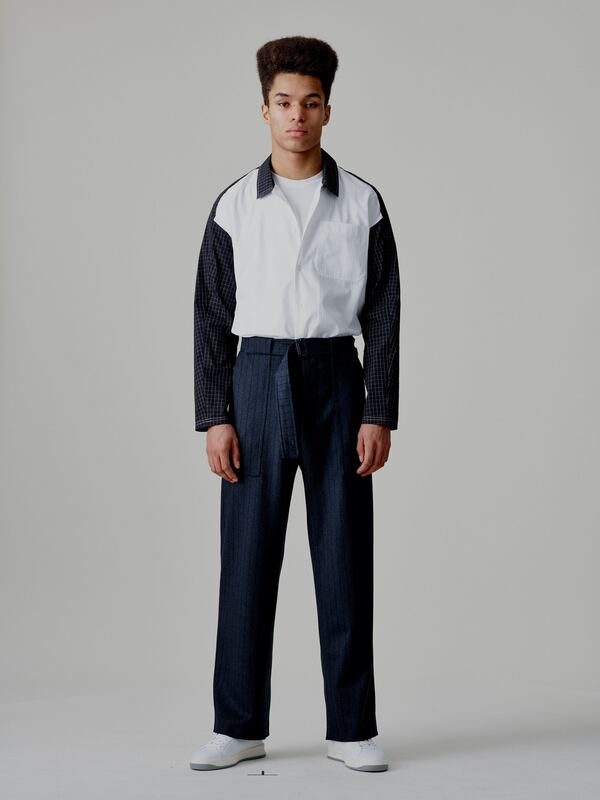 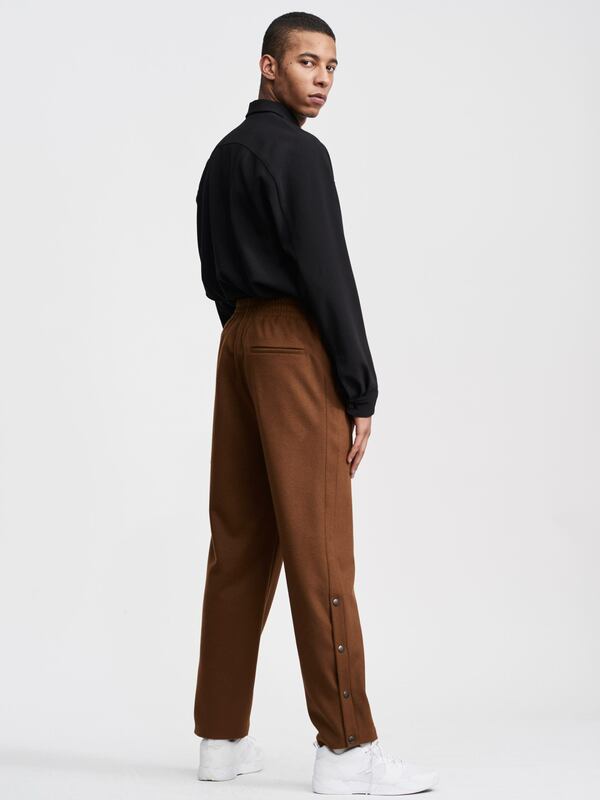 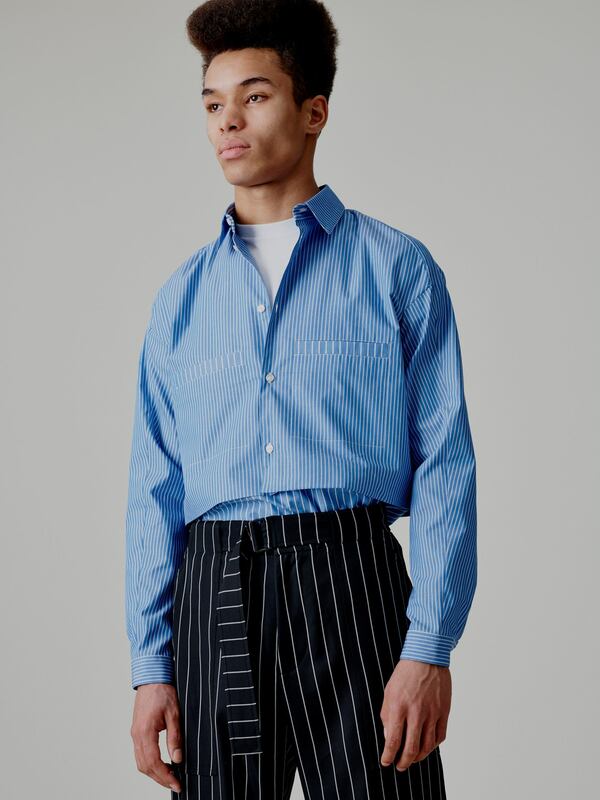 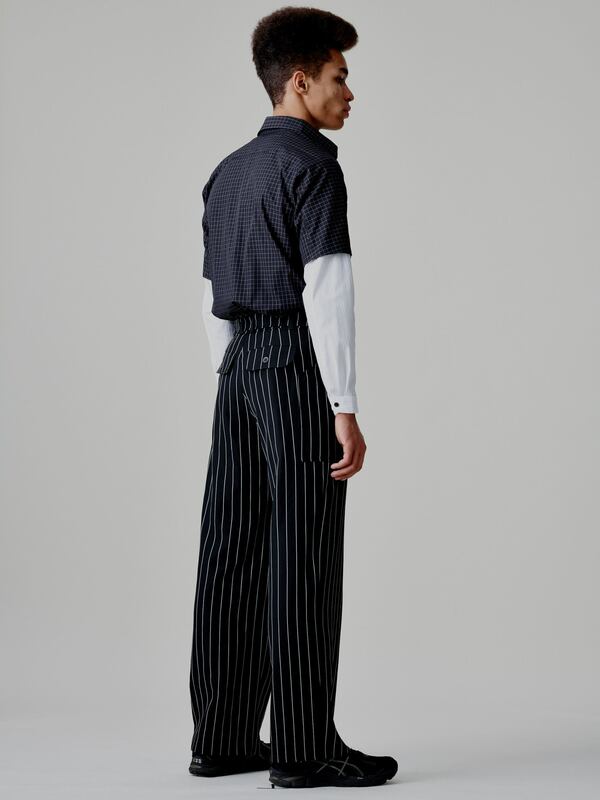 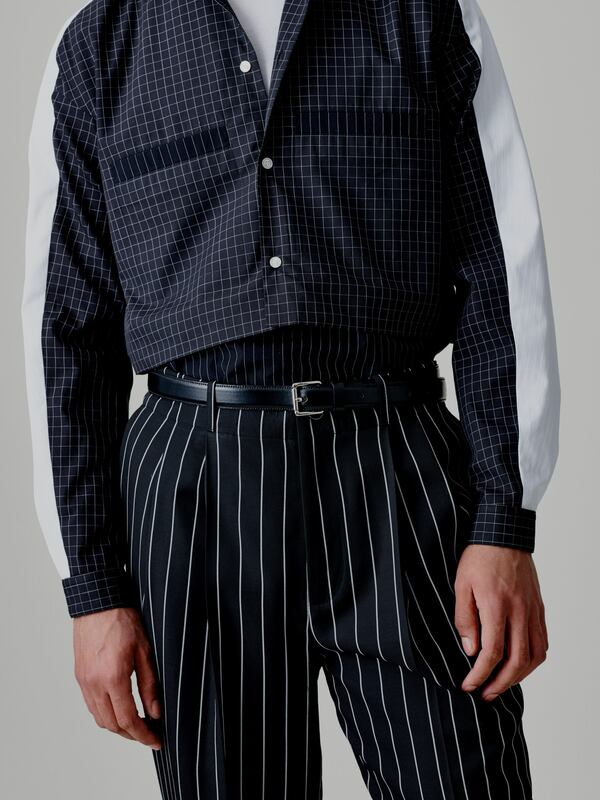 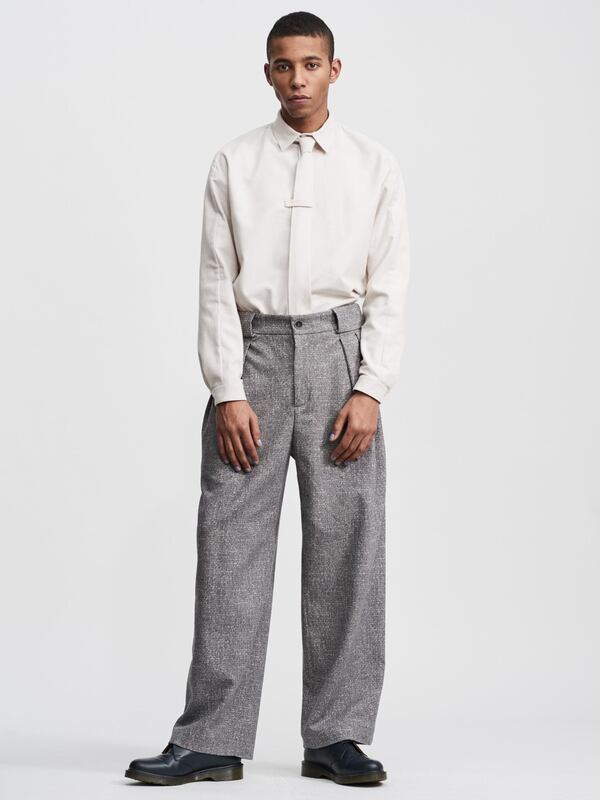 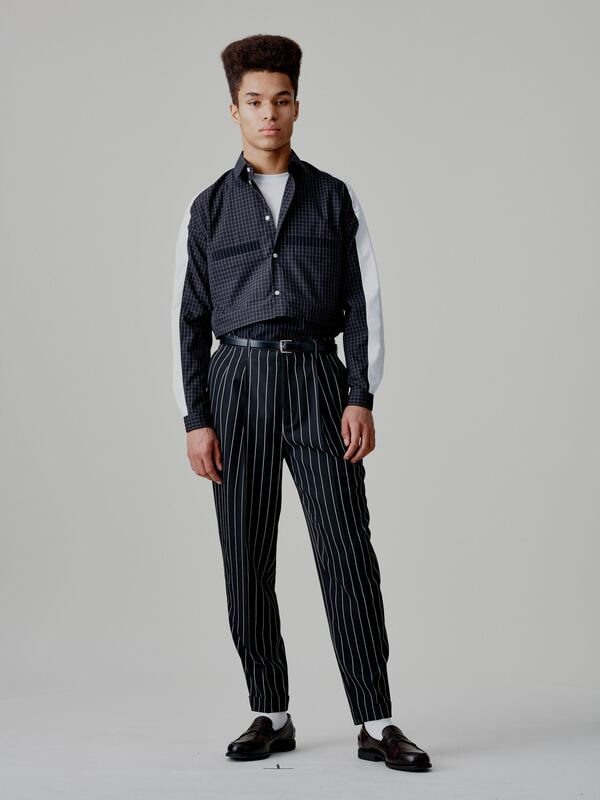 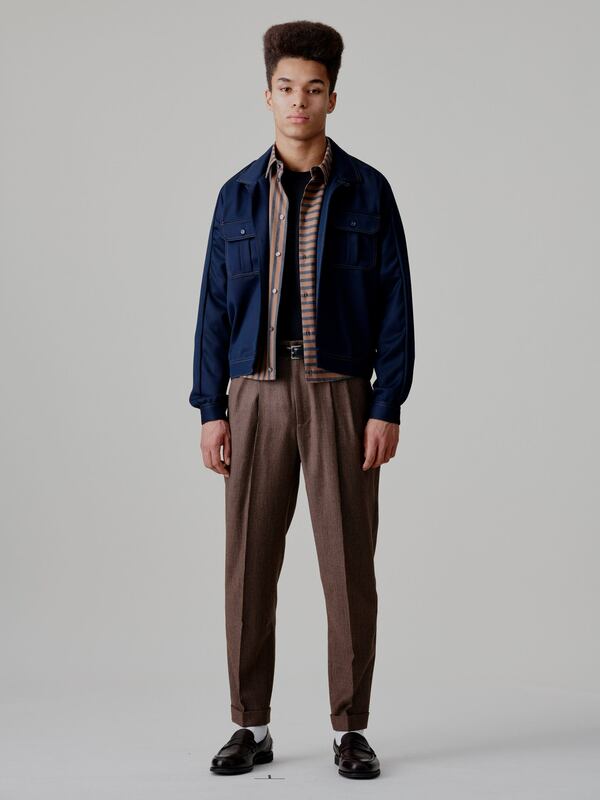 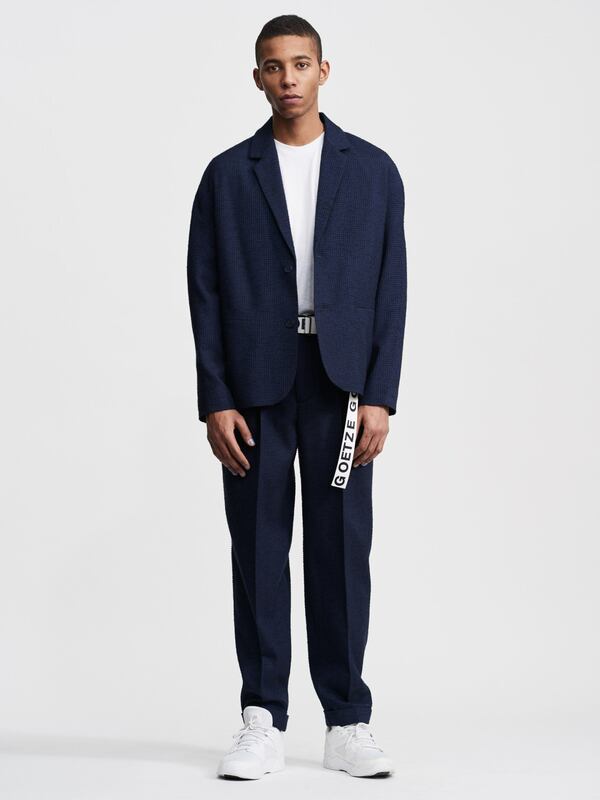 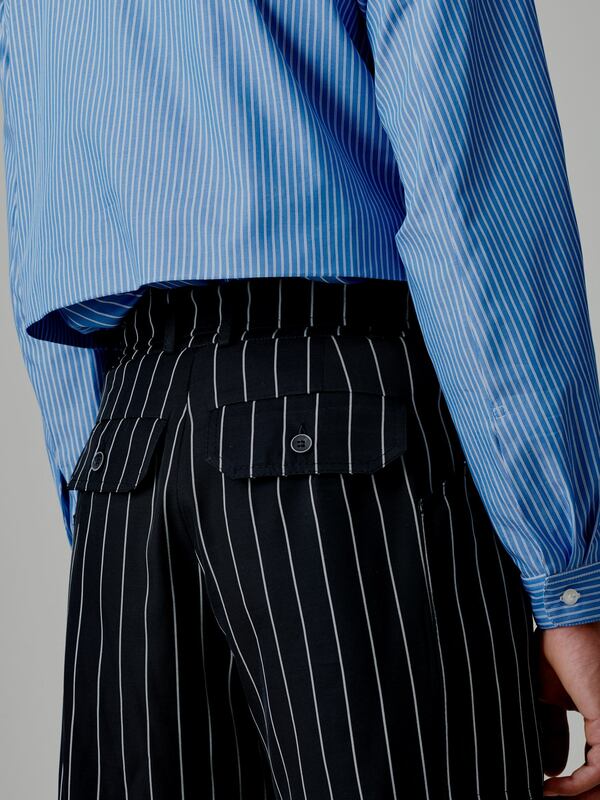 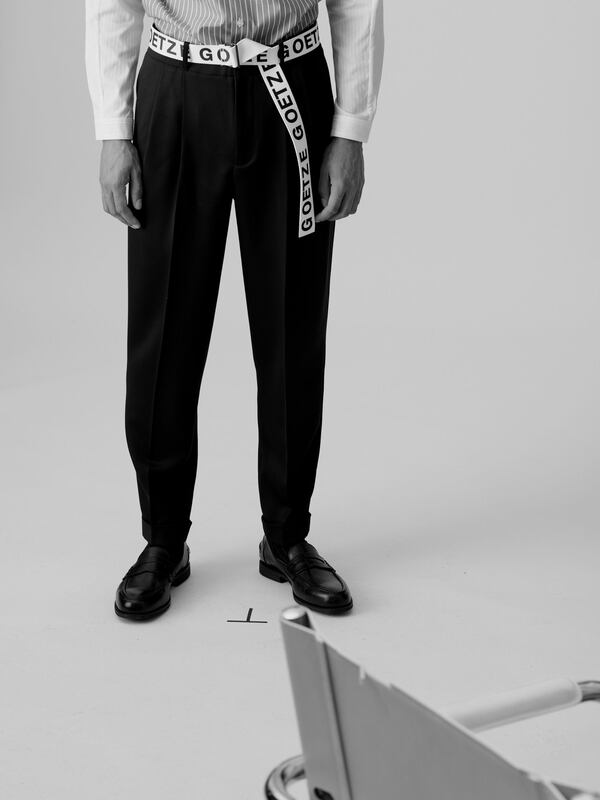 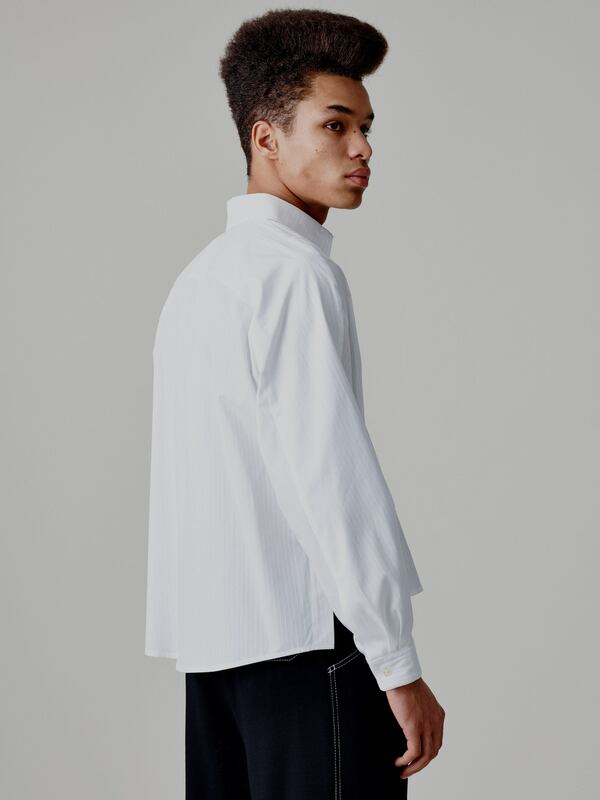 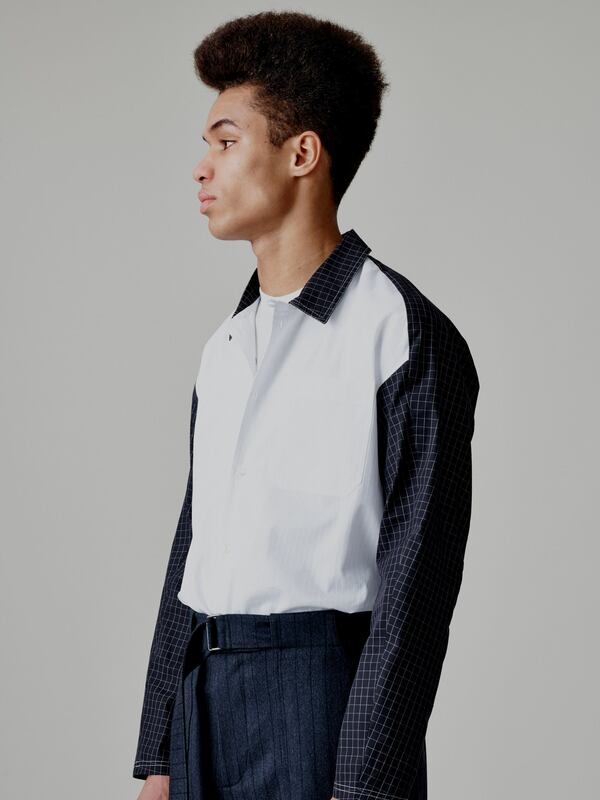 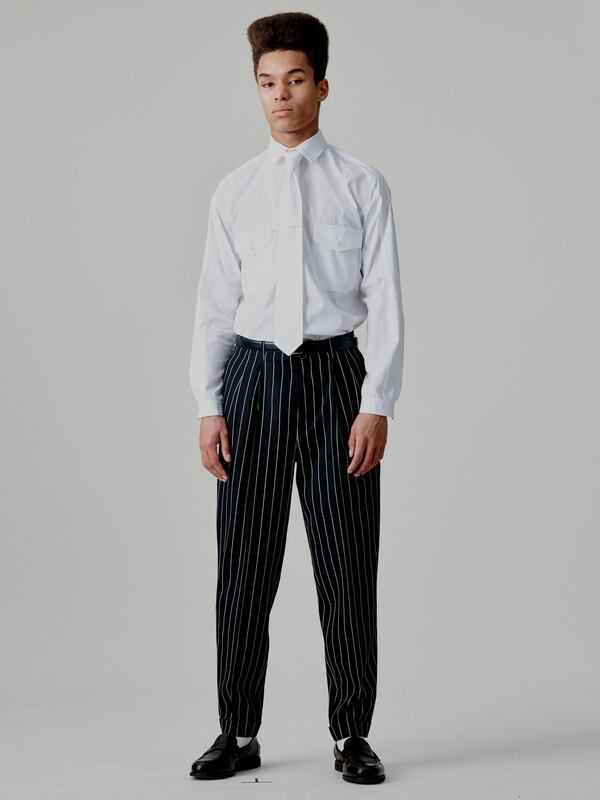 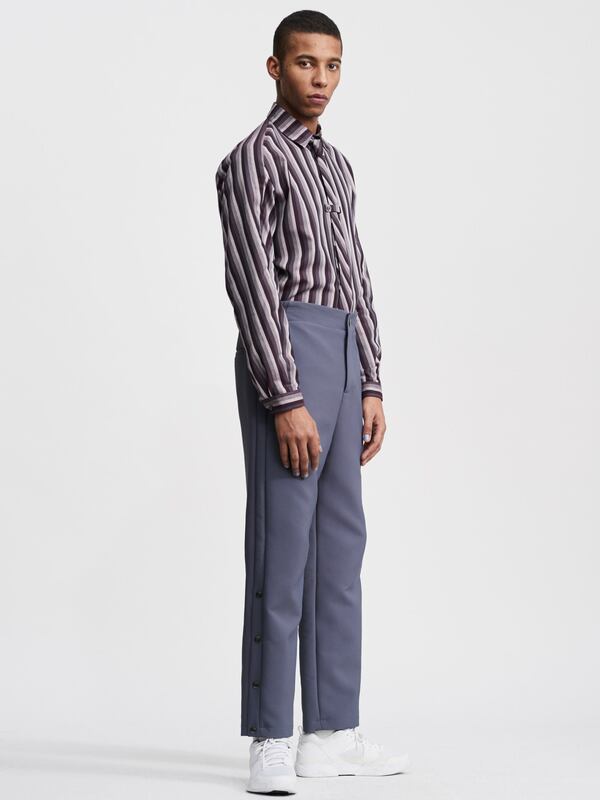 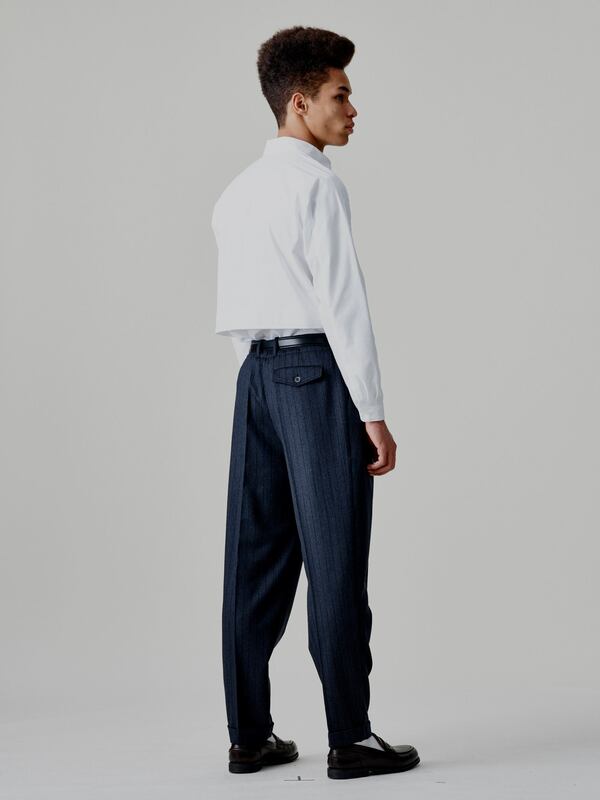 A classic summer suit is reinterpreted in a zip-up short sleeve shirt and wide high waist trousers making it a perfectly adaptable street wear silhouette. 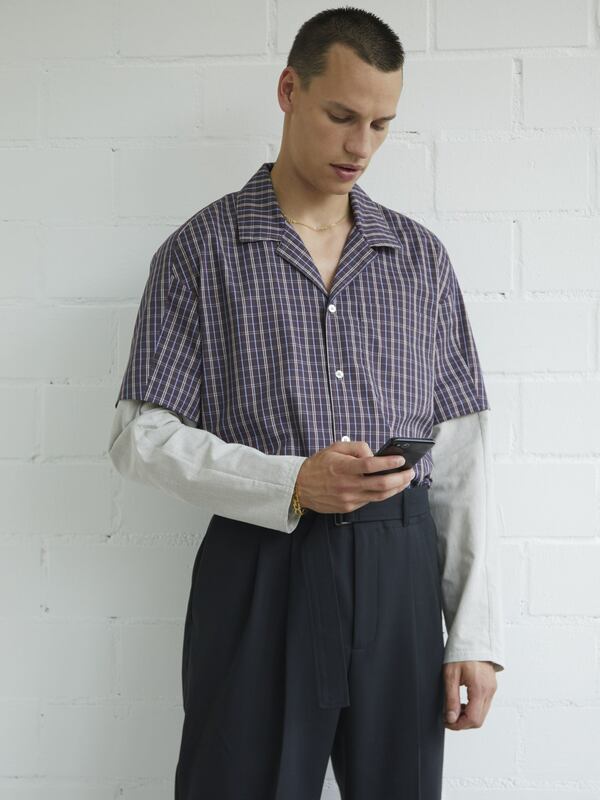 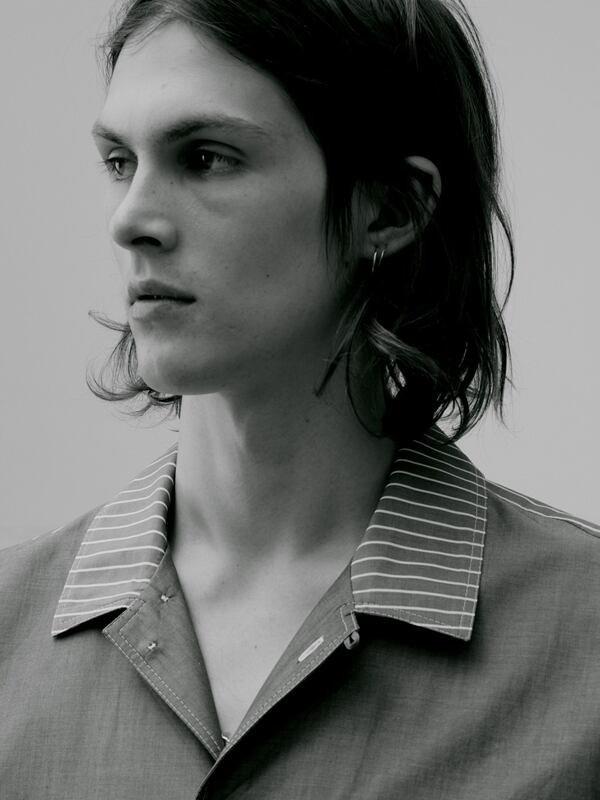 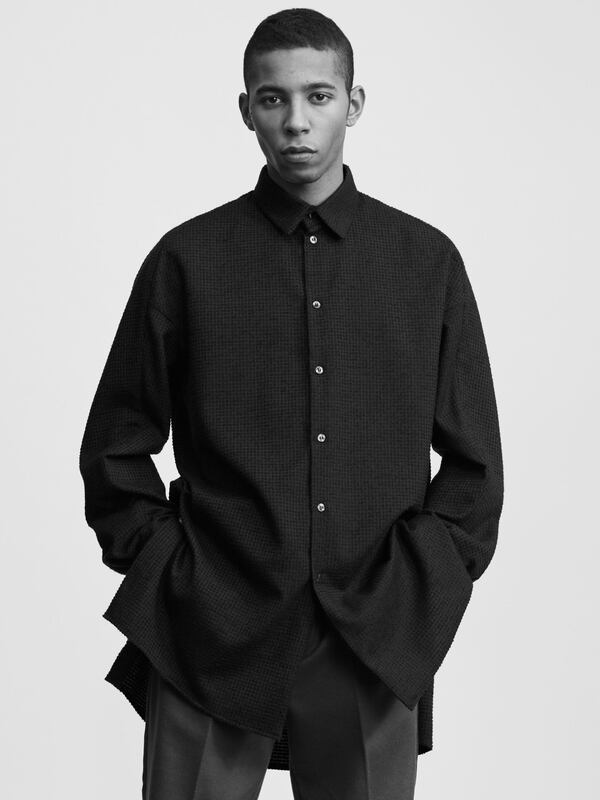 Shirts are heavily cropped, promoting a boxy and youthful silhouette. 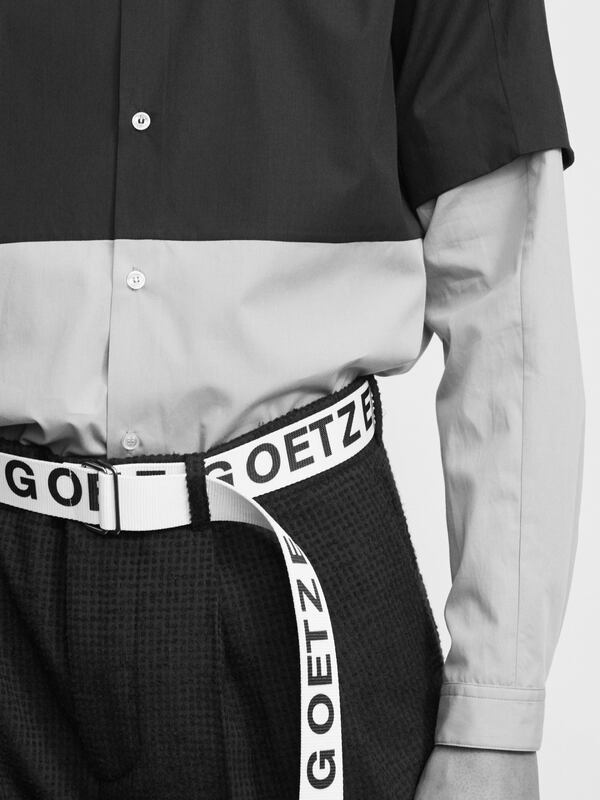 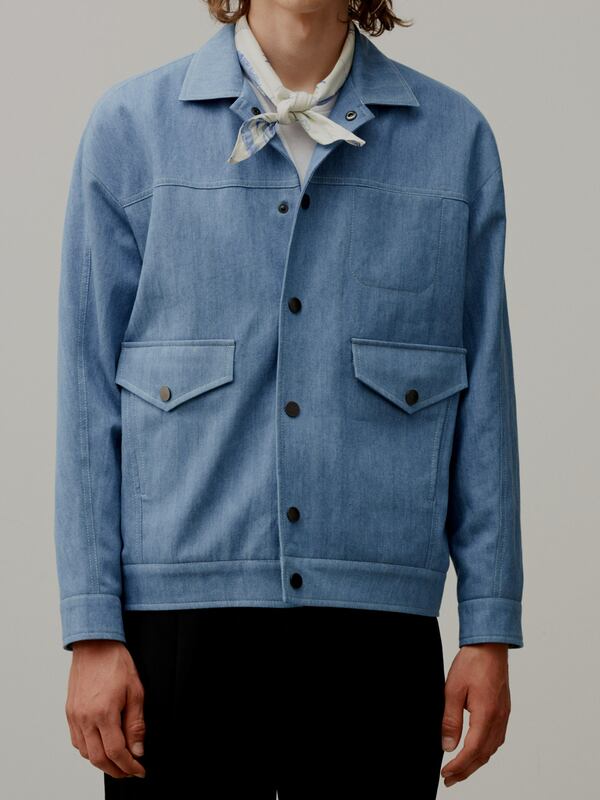 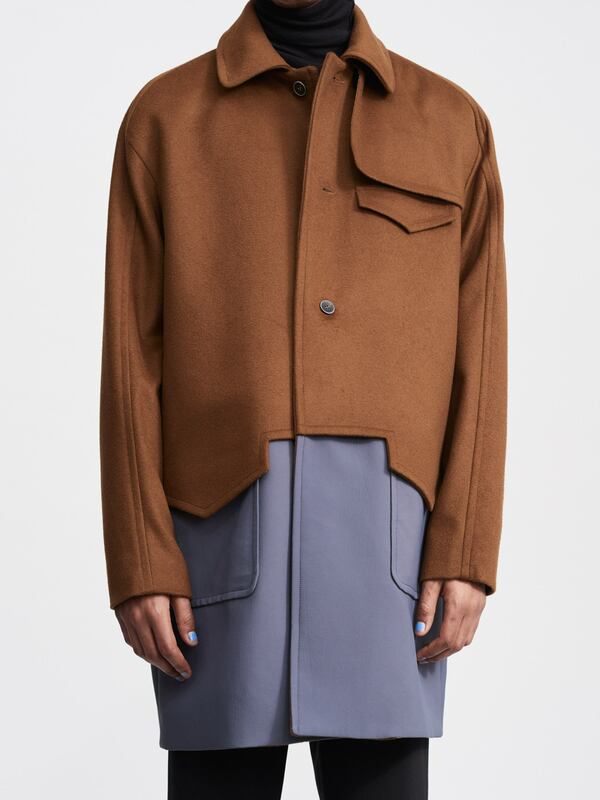 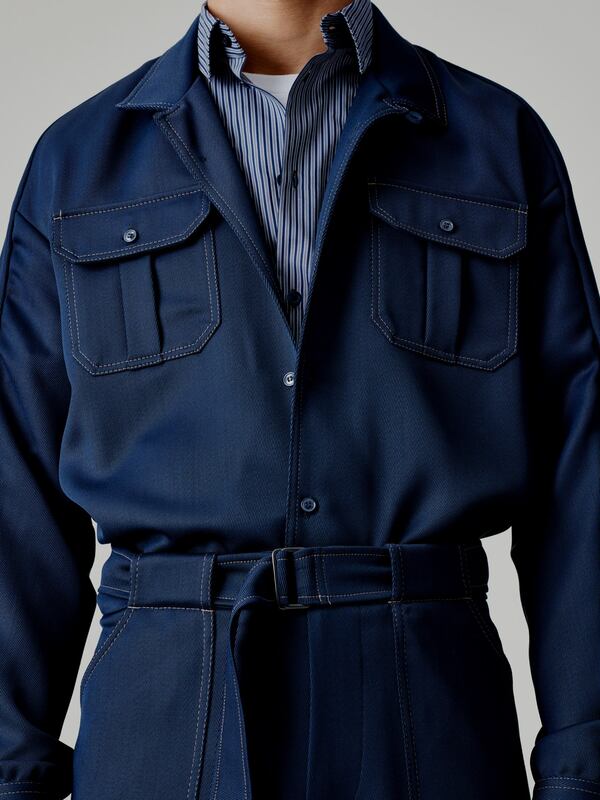 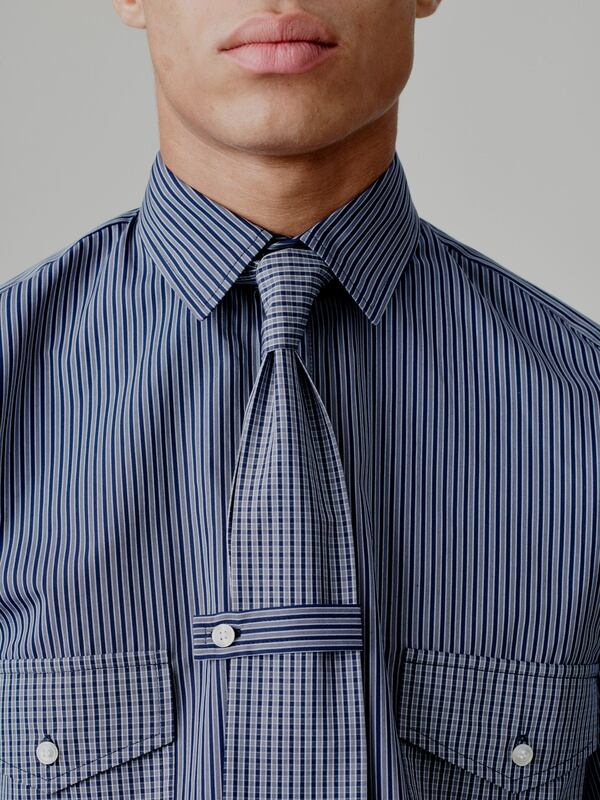 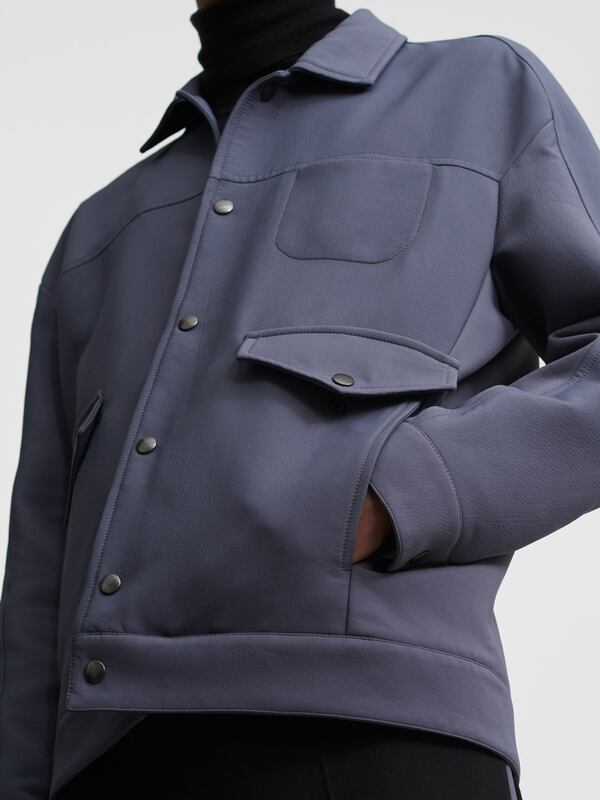 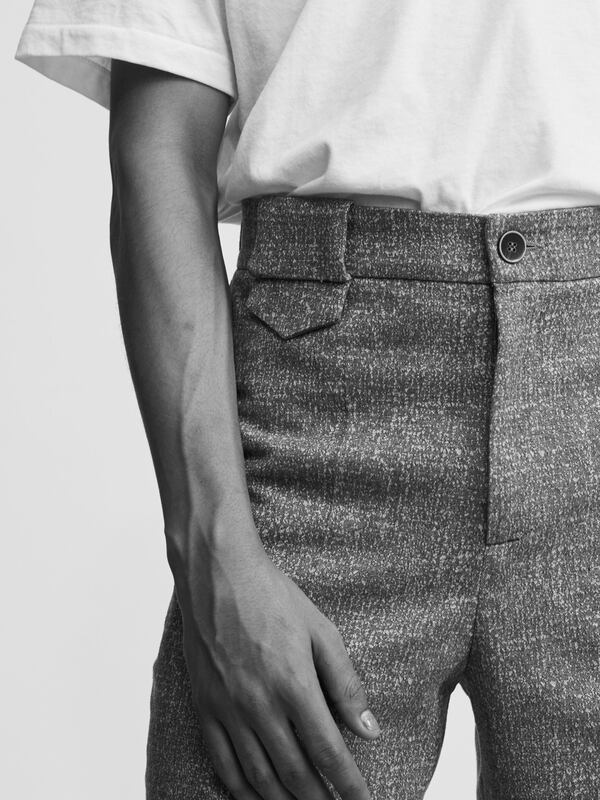 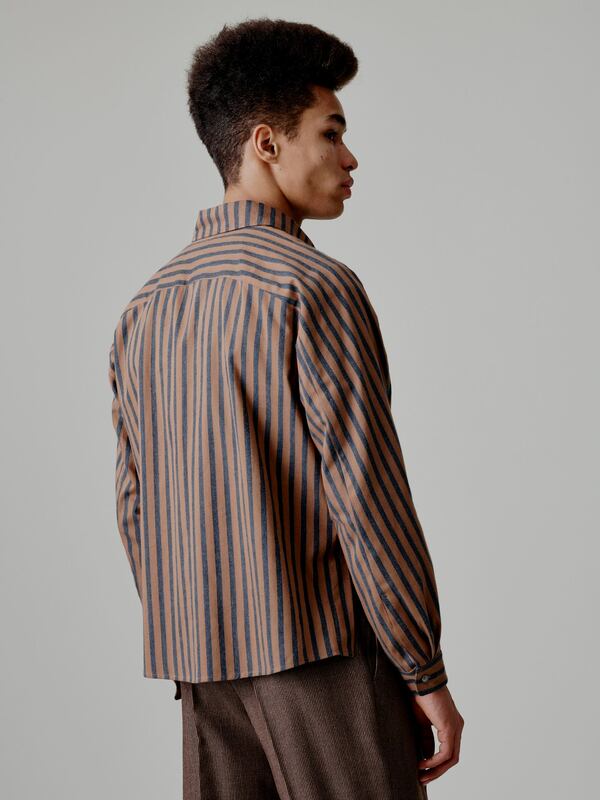 GOETZE continues the renegotiation of classic menswear items in an eclectic mix of detail and material. 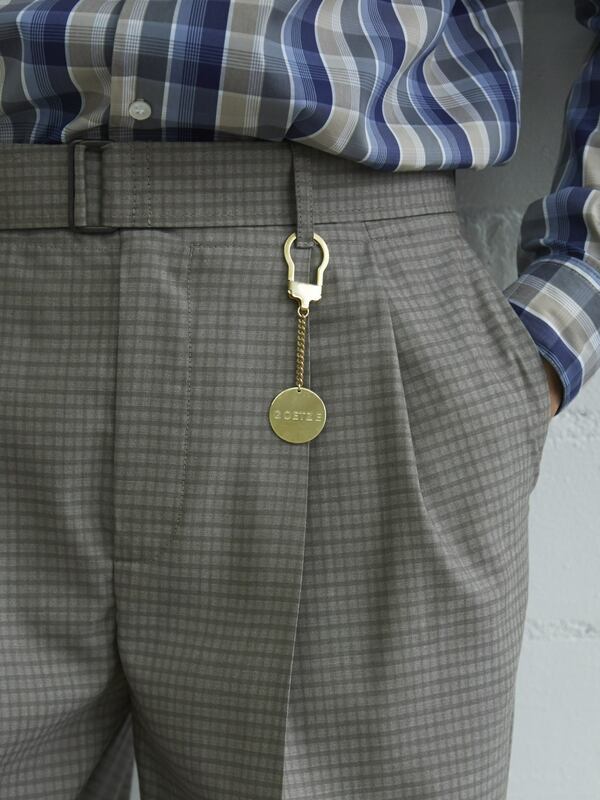 Subtle changes in almost identical materials create a slightly assembled look, whereas silver and gold plated logo key rings and logo pins add a carefully decorated element to the collection. 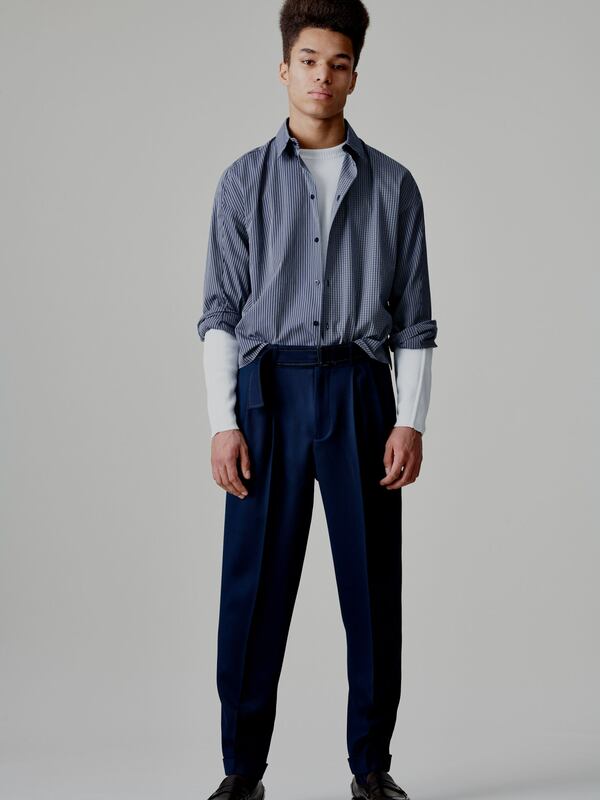 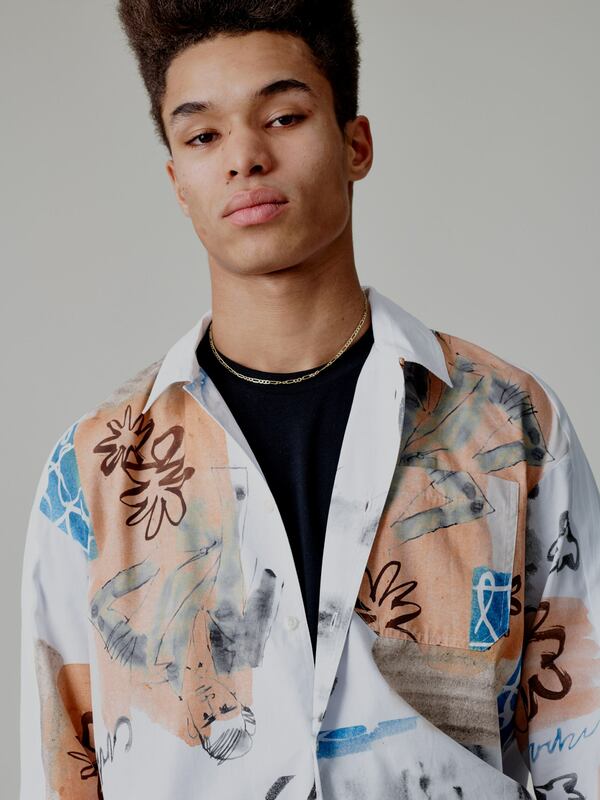 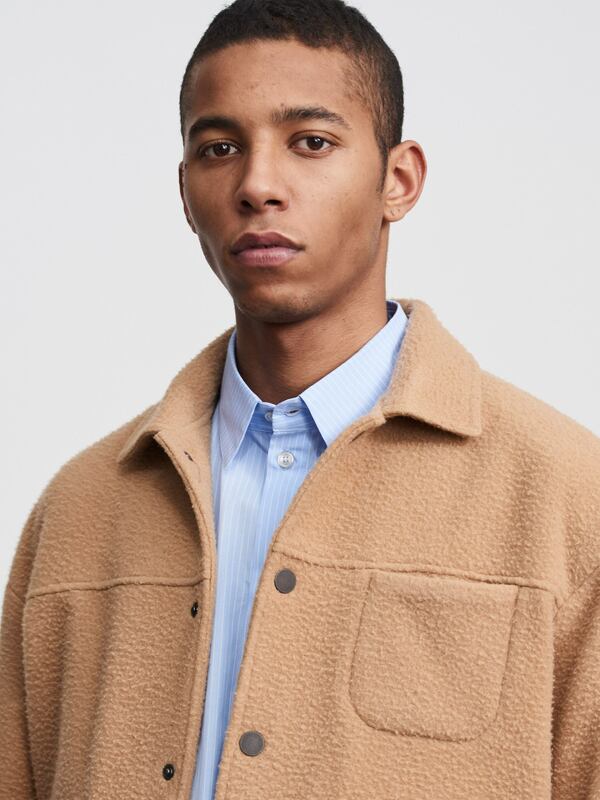 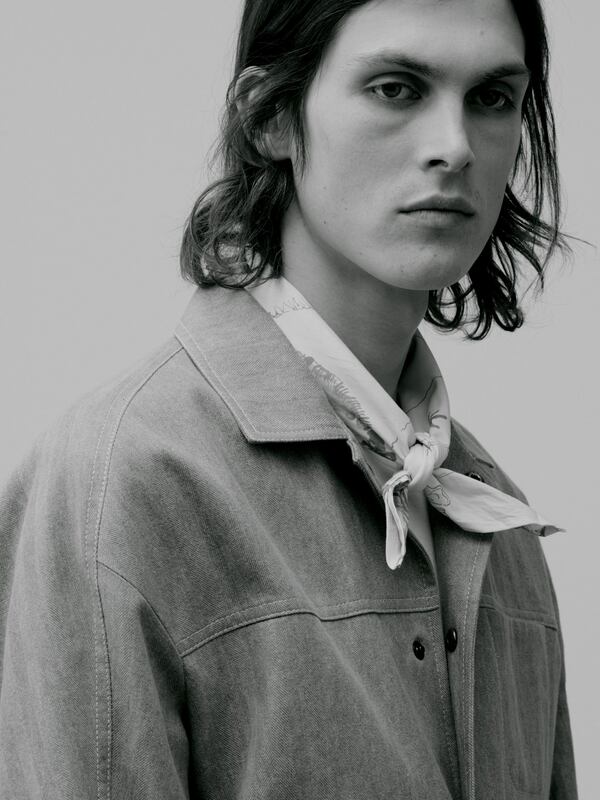 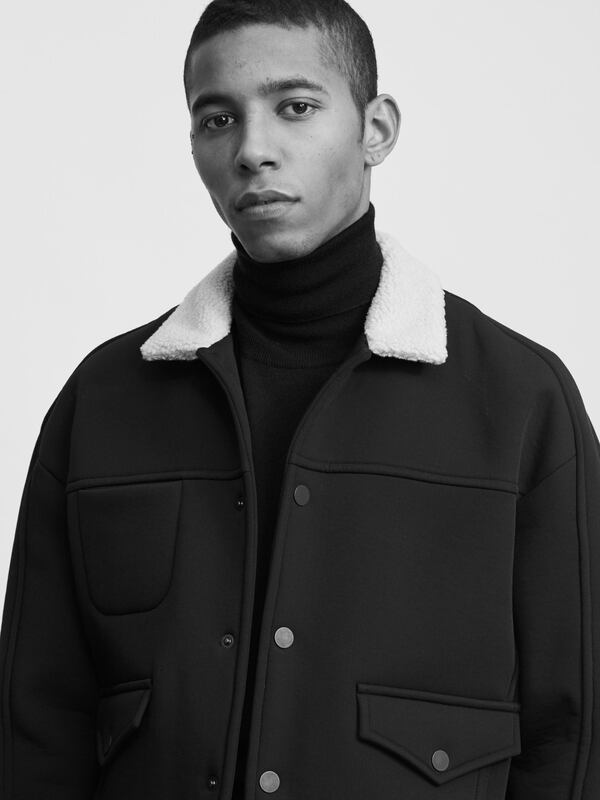 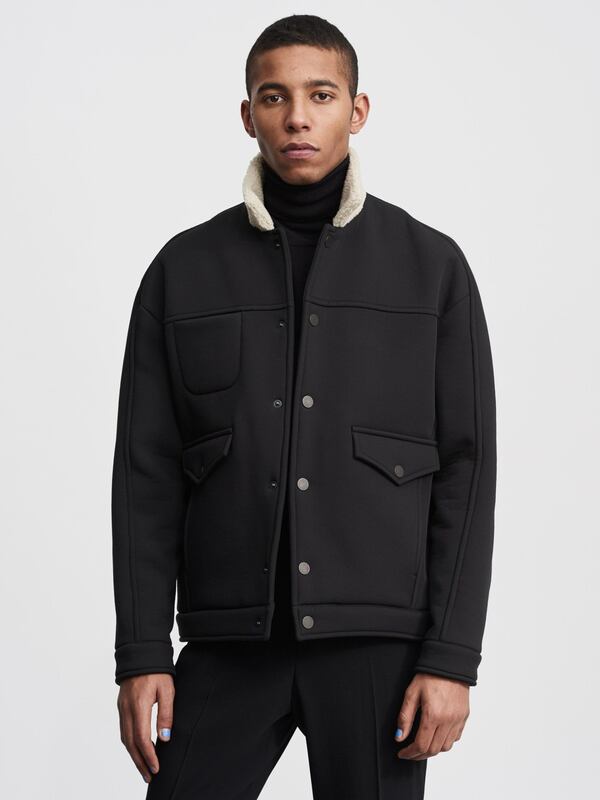 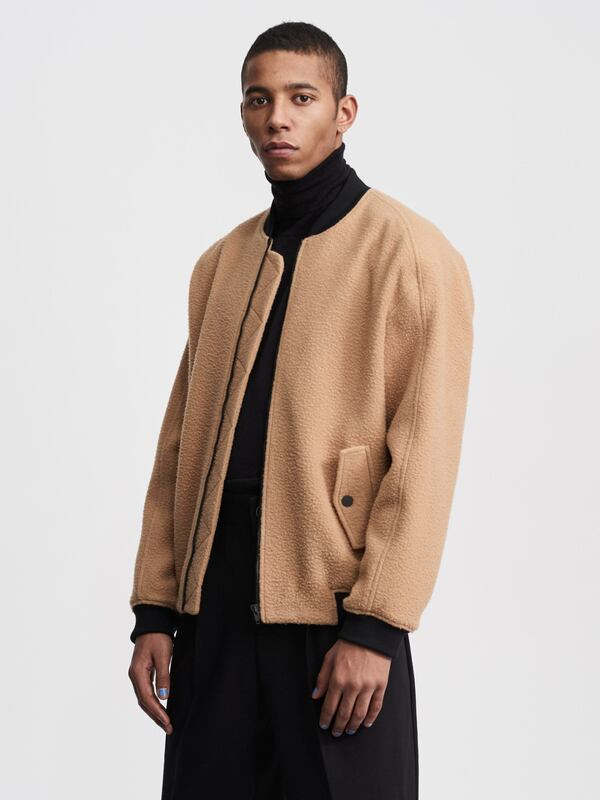 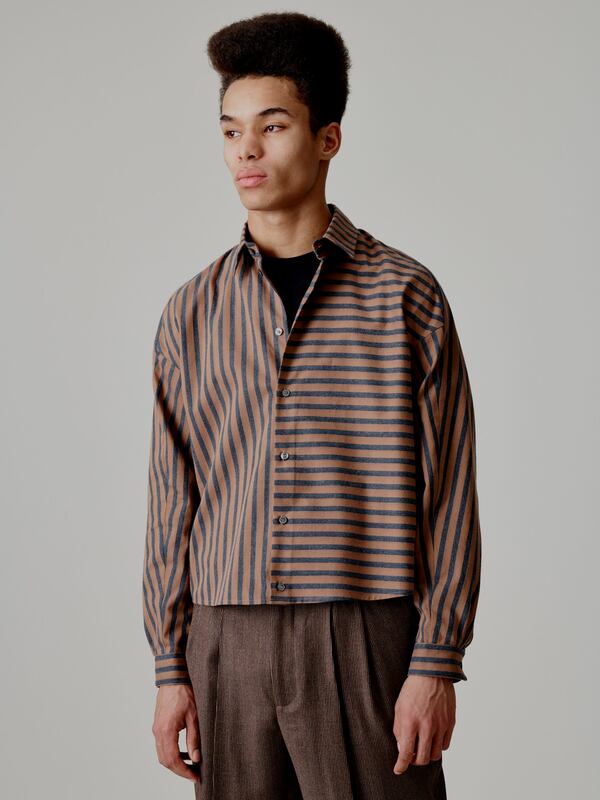 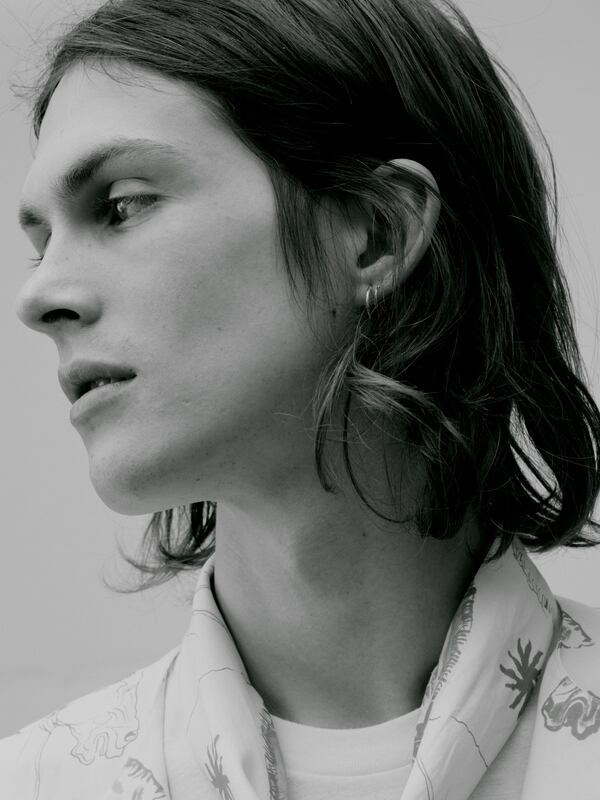 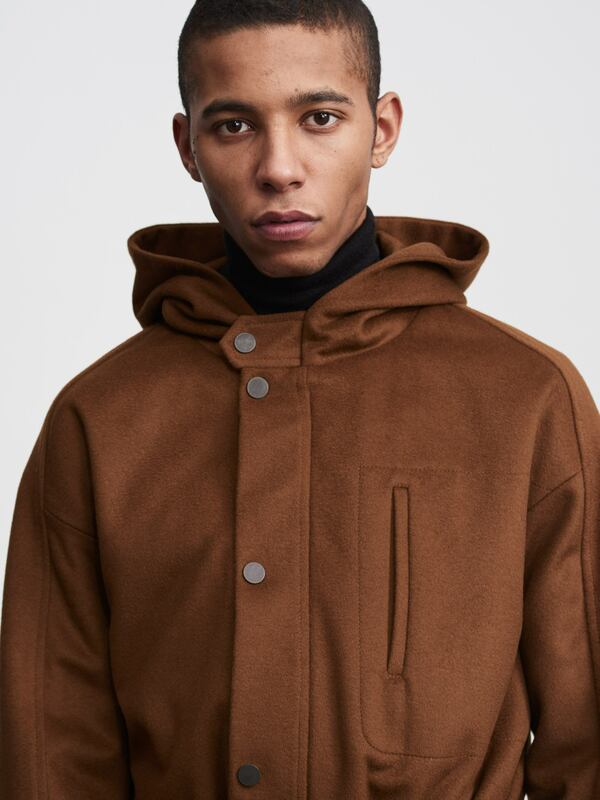 The A/W 18 collection draws inspiration from iconic aesthetics of the nineteen-nineties: a layered and assembled look, t-shirts worn over long sleeves, white contrast stitching in juxtaposition to the conservatism of Wall Street bankers. 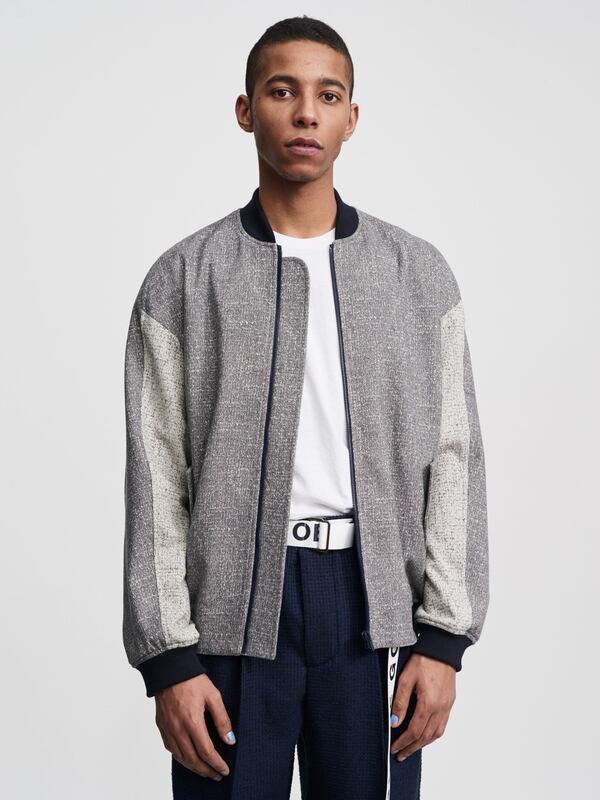 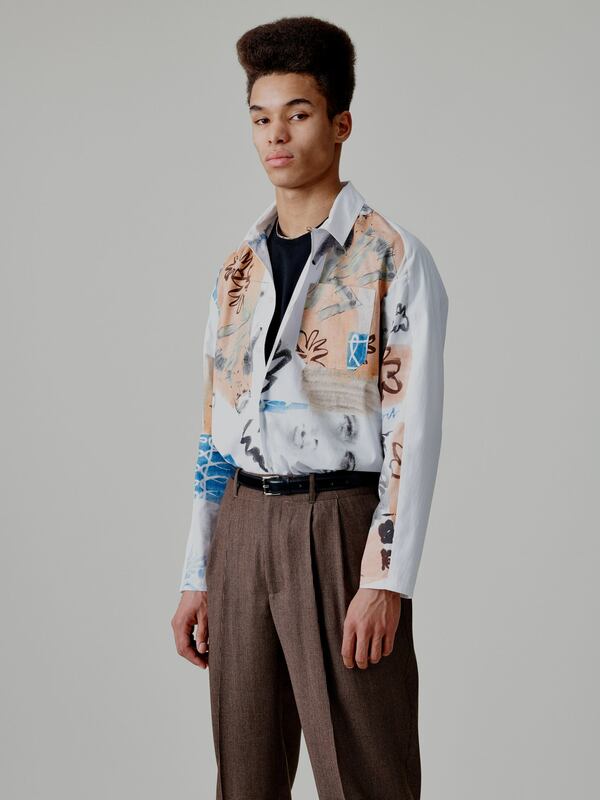 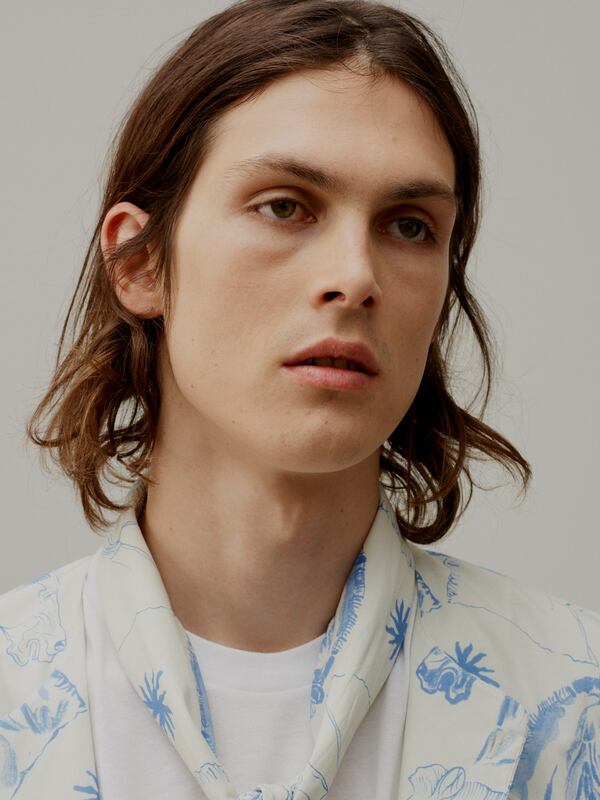 In this eclectic mood with interchanging graphic details, the overall look of the collection seems patch-worked, yet sophisticated with its slightly conservative materials. 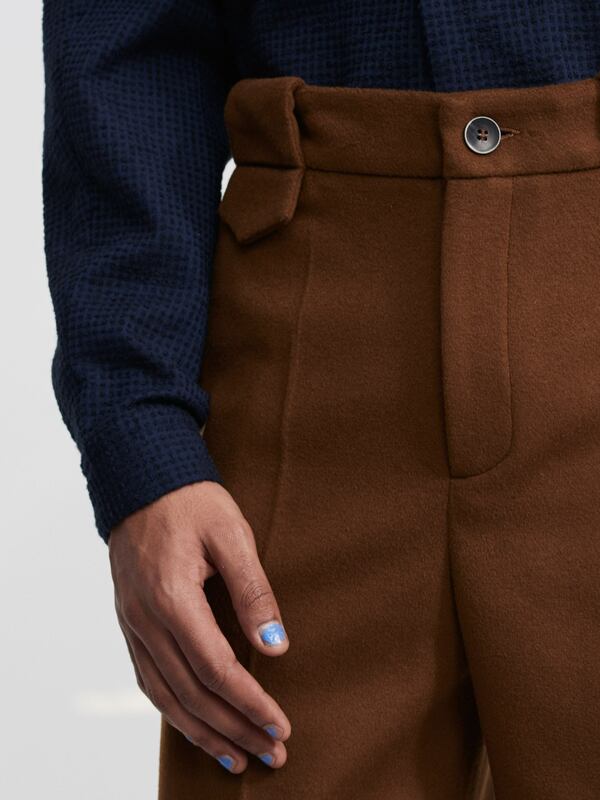 The outfits are then completed with classic pants and knitwear. 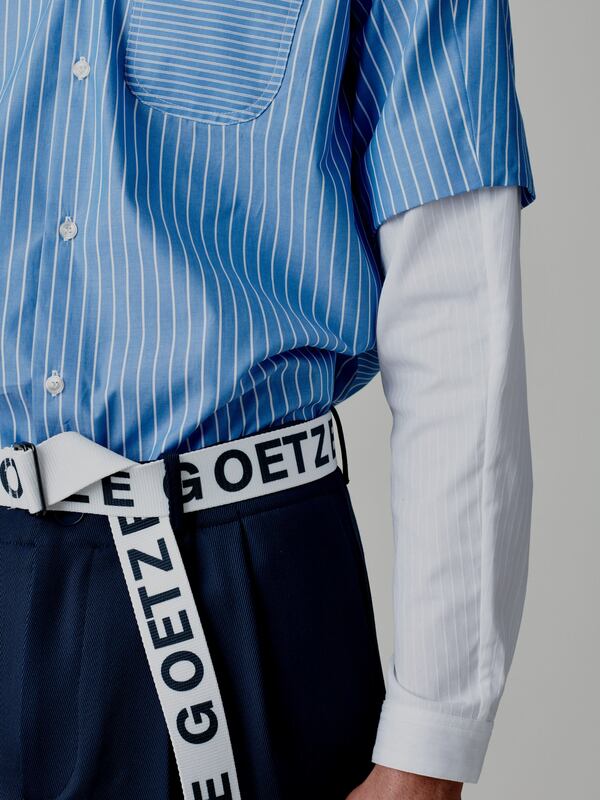 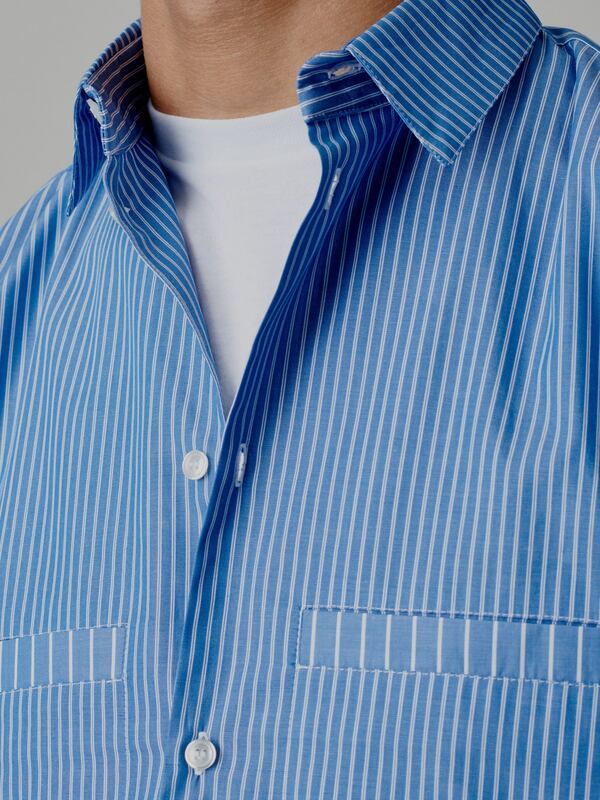 The signature GOETZE look will remain, yet more focused and concentrated on the core products, which the label is best known for - the shirt. 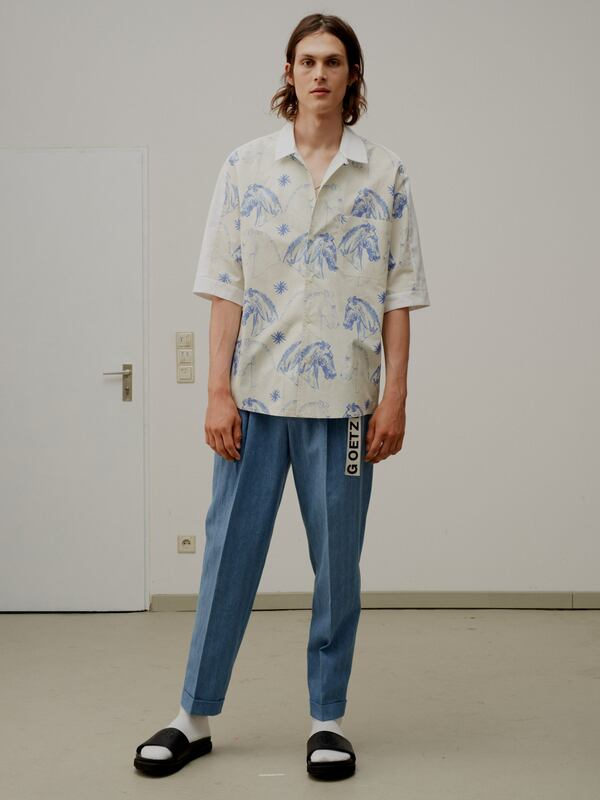 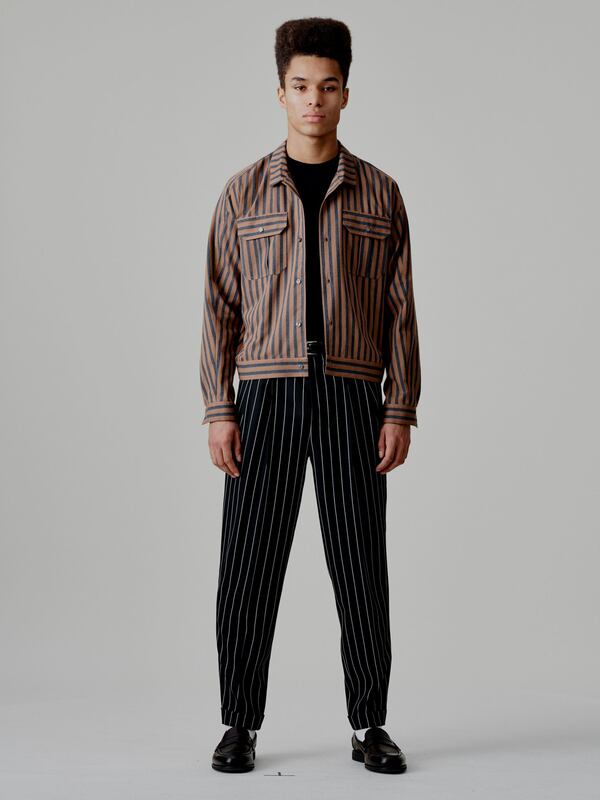 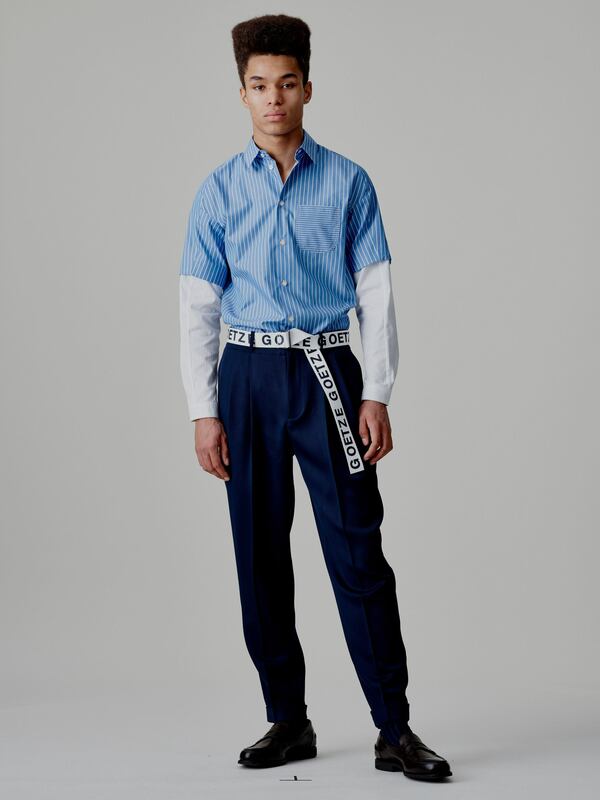 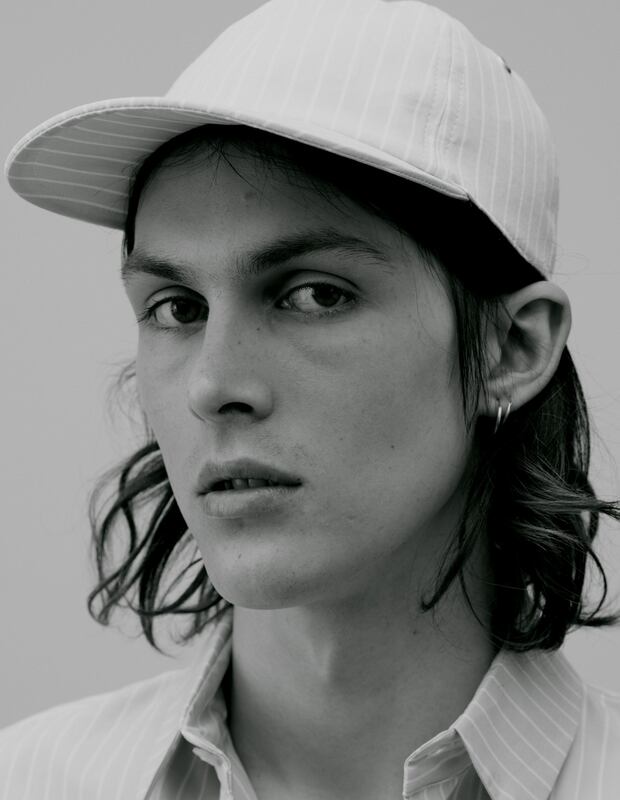 For SS18 GOETZE introduces a collection influenced by 90s streetwear elements and classical Mediterranean summer wardrobe. 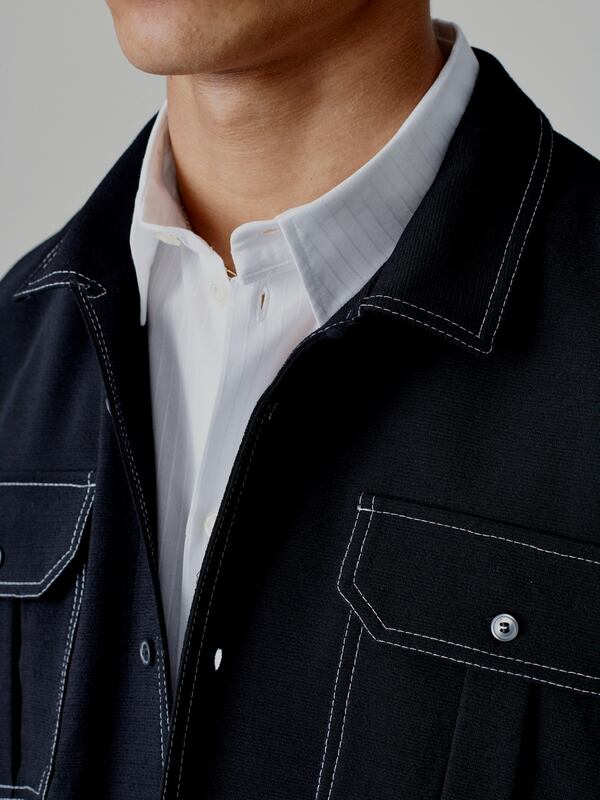 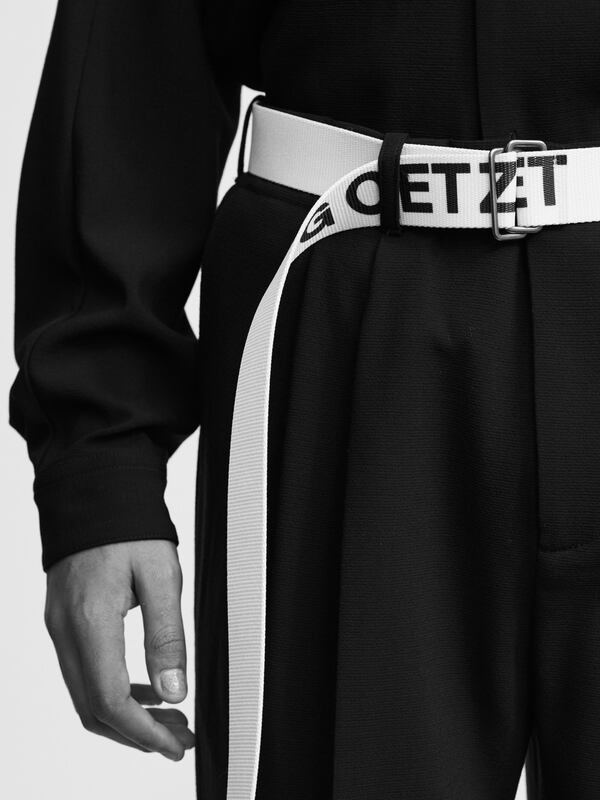 The signature GOETZE sleeve construction, the meticulous attention to details, the precise finishing conjoin the relaxed fits of the SS18 pieces, evoking an effortless sportive appeal. 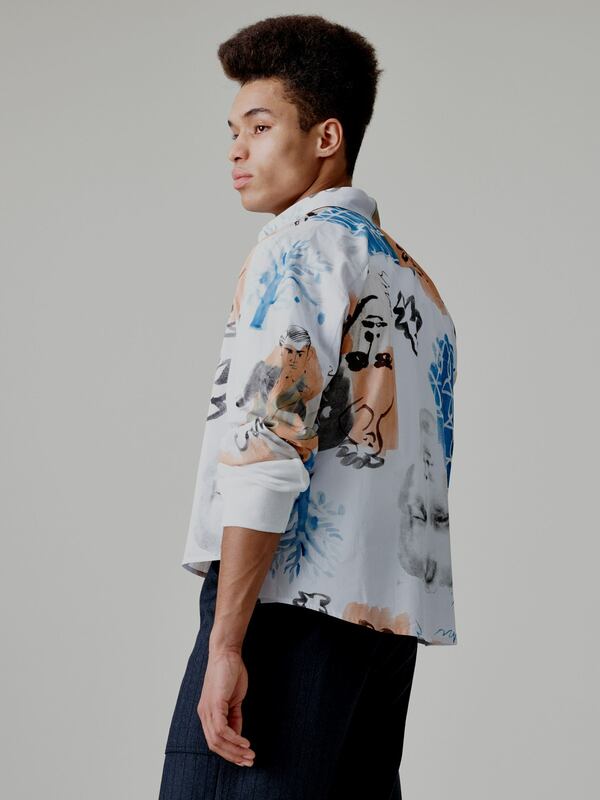 Once again GOETZE teamed up with illustrator Tony Stella, to create a playful horses head shirting print. 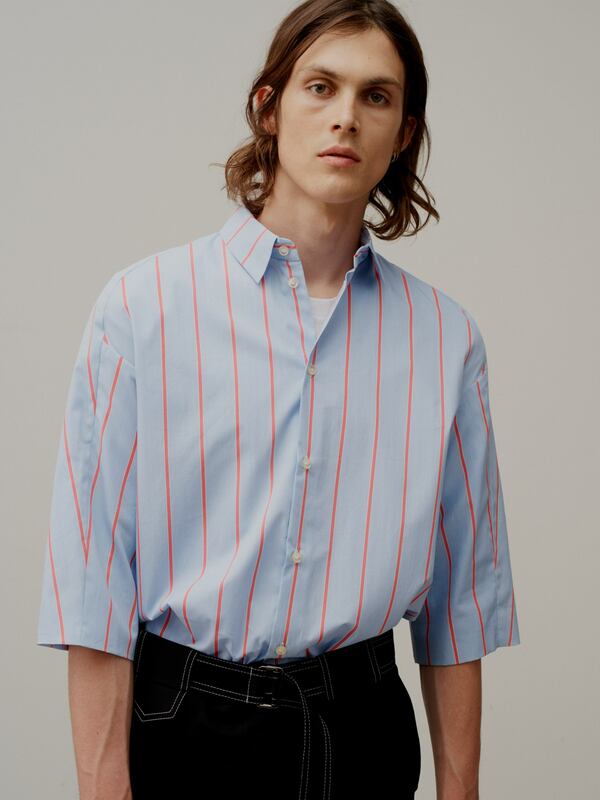 This classical figurative motif, executed in a delicate sky-blue aquarelle, stands in juxtaposition to the very geometrically constructed GOETZE shirts. 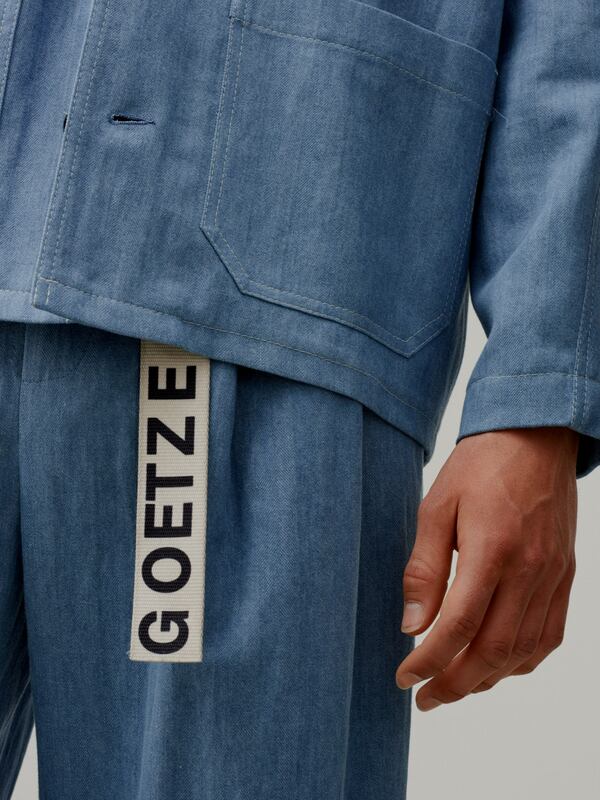 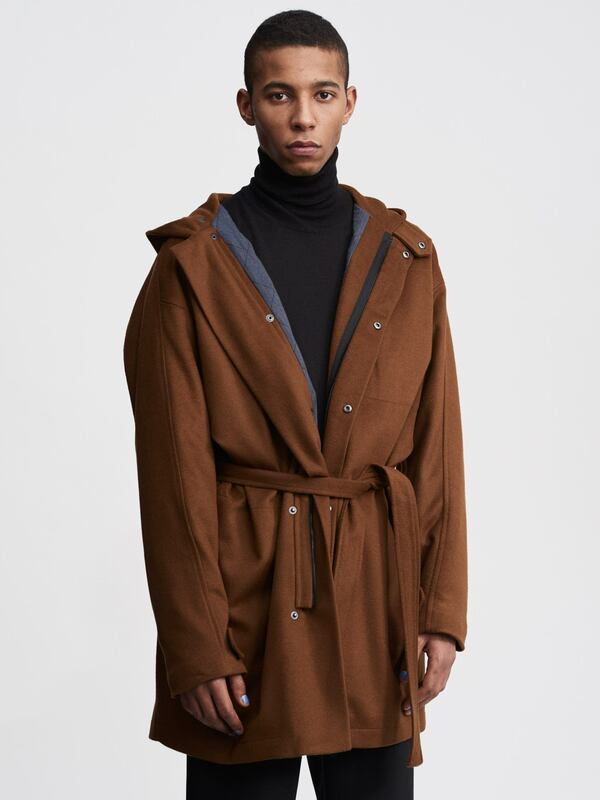 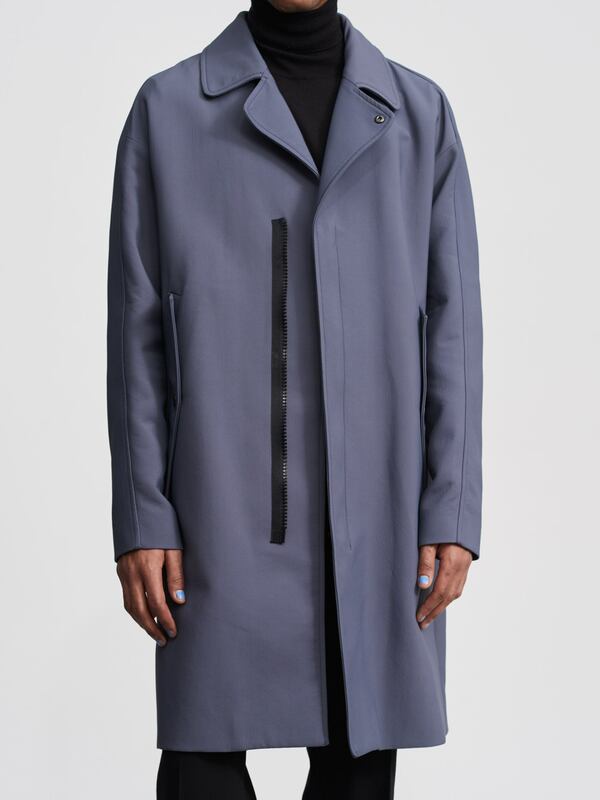 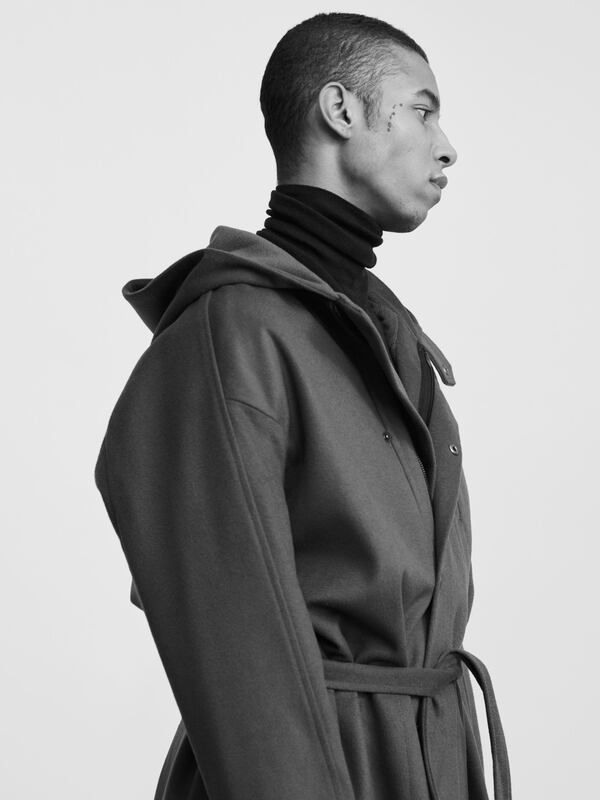 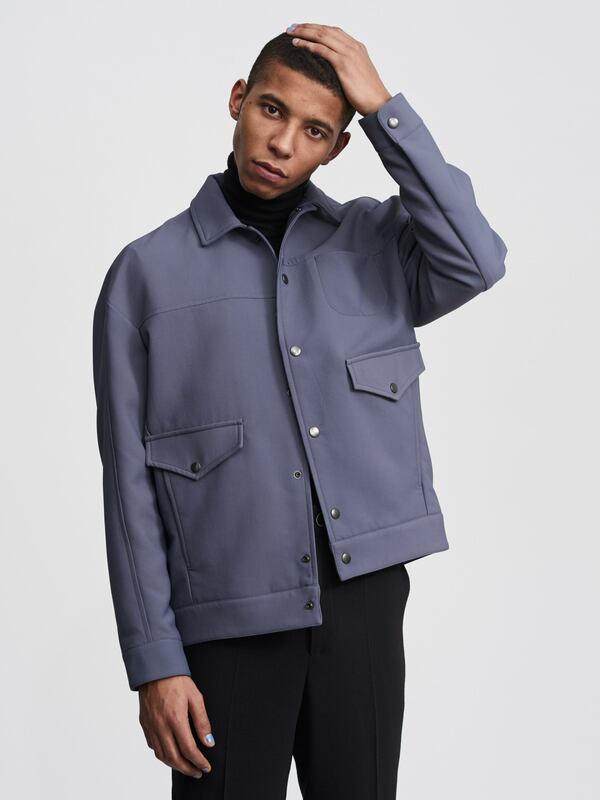 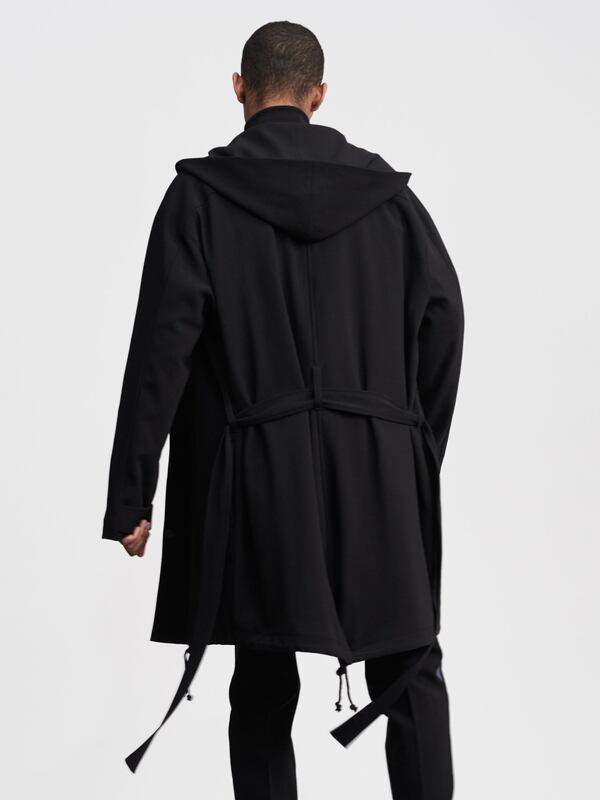 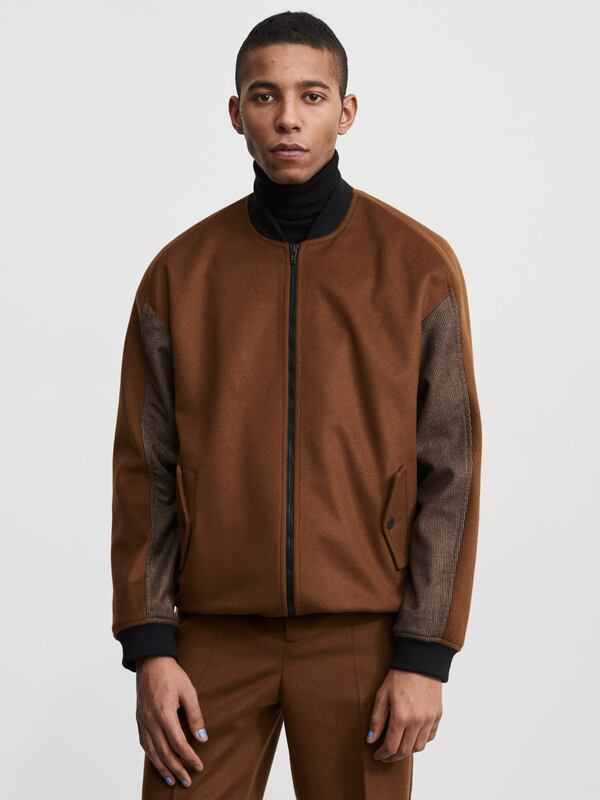 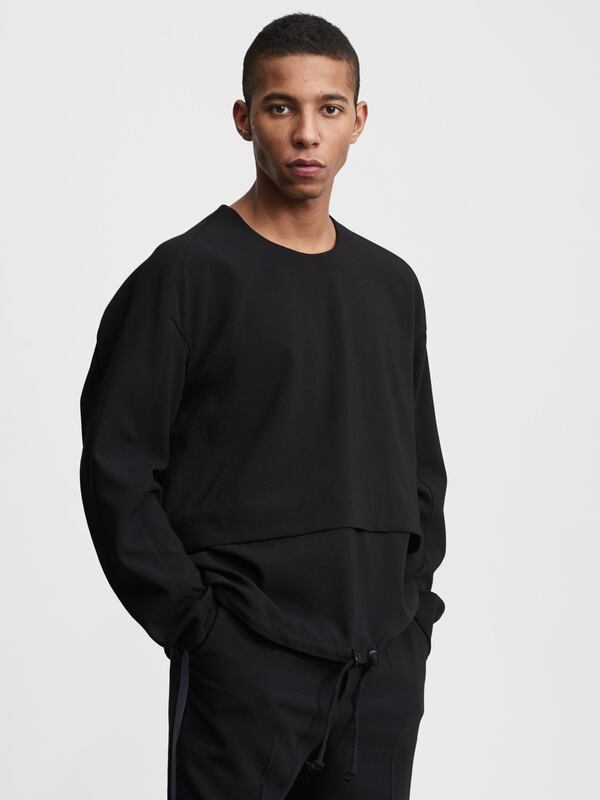 GOETZE merges contrary concepts, continuously reinterpreting essential sports and workwear elements with a contemporary and luxurious touch.